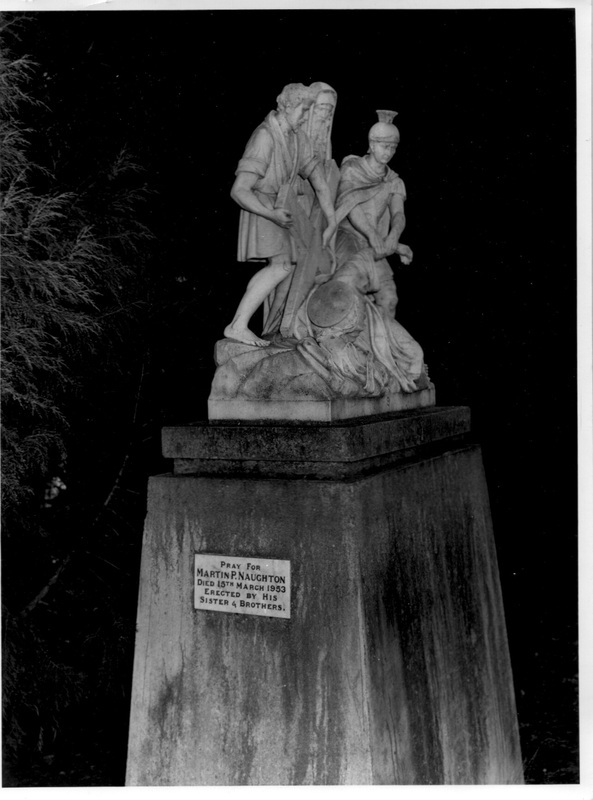 The story of one of Goulburn's past mayors, Francis Tait, reveals an interesting facet of the city's history. Francis Tait was born at Thornley, Durham, England in September 1838. As a lad from school he became a Wesleyan lay preacher and at an early age gained experience in commerce and management when he took employment in Newcastle. At the age of 27 he entered the Wesleyan Missionary College at Richmond Hill, London. Here he undertook special missionary training for overseas. Shortly afterwards Mr Tait married and accepted a posting of the Church in Fiji where he arrived in 1860. He found conditions very primitive and Christianity was indeed sparse. The Taits lived among the natives with whom they became friendly and soon built up a considerable goodwill and trust among them. He also earned the respect of the white population. The general high regard he was held in caused King Thackambau to ask him to act as the chief's European advocate. At the coronation of King Thackambau, in 1870, Mr Tait was invited to preach and give the Coronation address and sermon. After 10 years in Fiji, he found his wife's health demanded a change of climate. He came to New South Wales for about a year taking a liking to the climate decided to stay. He requested a church appointment and was posted to the Grafton and Armidale area. In due course he became the chairman of the circuit whilst remaining Armidale in 1872. After three years in this circuit can move to Sydney where he was appointed to the Chippendale church. 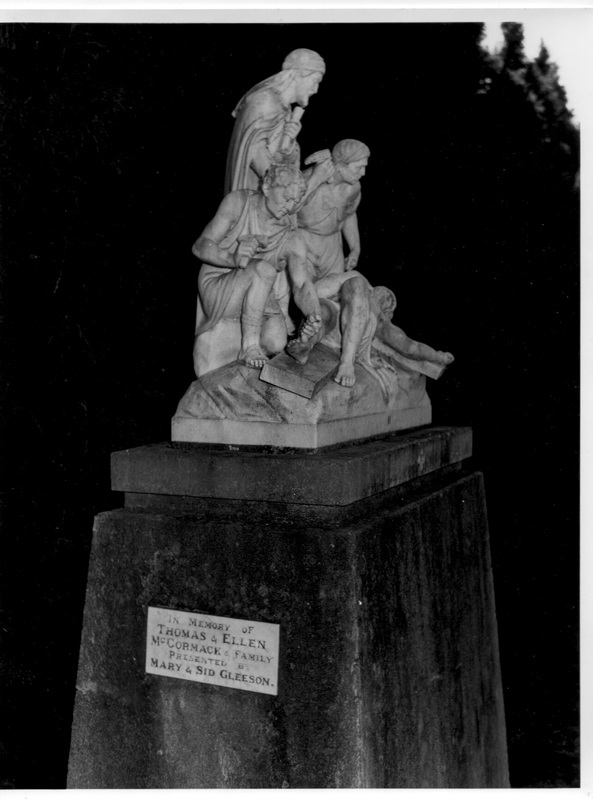 He remained here until 1878, then went to Goulburn continuing in the ministry here for some time, he suffered a severe affliction of the throat. Obtaining medical attention he finally spending some time in England hoping for a cure. He was advised that he should give up his preaching and find some other calling in life. However, he did not desire to leave the ministry but returns to New South Wales and again took up his clerical duties, this time at Orange. His condition worsened and he then decided to leave the ministry. At the Wesleyan conference in Sydney, on January 23, 1883, his case was given consideration. His medical history insured his resignation from the cloth which was backed by hiss many Goulburn friends and members of his previous congregation. districts in New South Wales. He also did most valuable services in selecting 12 young ministers in England and bringing them out to this colony and Queensland. We deeply regret that he is compelled to rest from circuit work and earnestly pray that God may bless him in his retirement." Francis Tait then turned his attention to commercial pursuits. He was associated with the Australian mutual building an investment company of Sydney. This company offered Mr Tate, the management of a branch at Goulburn which he was happy to accept as he was particularly keen to return to Goulburn. In addition to his management post he threw himself into many activities. He was appointed a Commissioner of the Peace. He was also a member of the first Land Board. In 1883, Tait was manager of the great Galena Silver Mining Company as well as the secretary of the Little River Gold Mining Company. He was appointed Justice of the Peace. In 1884, he was elected to the Goulburn City Council. In 1885 he, contested the general election of the Goulburn Legislative Assembly. He became Mayor in 1887. Tait was opposed to the Dibble Ministry but when the Robertson Administration took office soon afterwards he gave it his full support. Upon dissolution of the Robertson government in January, 1887, Tait retired from politics and devoted himself to the business of his company. Always and ambitious man, in 1885 Tait built a fine mansion house at Kenmore estate which she called Ravenswood. As mayor he laid the foundation stone of the present Townhall on December 9, 1887, in the presence of the Governor. Saturday morning last the mayor of Goulburn was seized with apoplexy and almost before the danger could be realised by his friends, and the public, he was struck down by the remorseless hand of death. Tait, 49 was survived by his wife and two sons. The decline of his financial position at this time and his suddenly death gave birth to much gossip and rumour. One was that he committed suicide in the front room of his mansion because he was so burdened with financial worries. 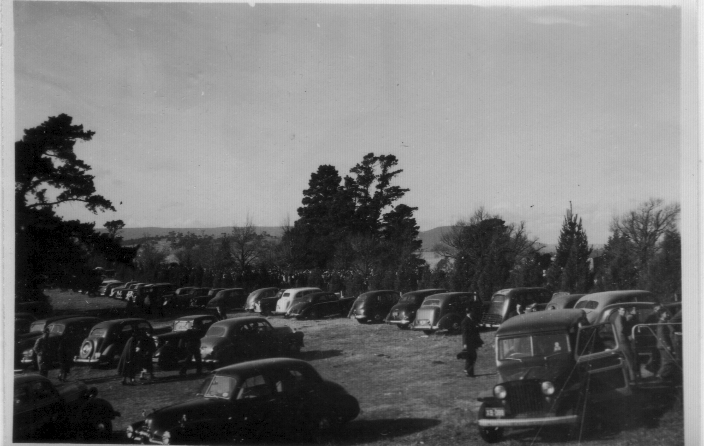 Another was that despite having one of the largest funerals in Goulburn he had arranged a mock funeral and made off. The stories continued well into this century at times with the most astounding garnishes. All these imaginative tales were without the least foundation as Tait was an honourable man of the very highest public regard. 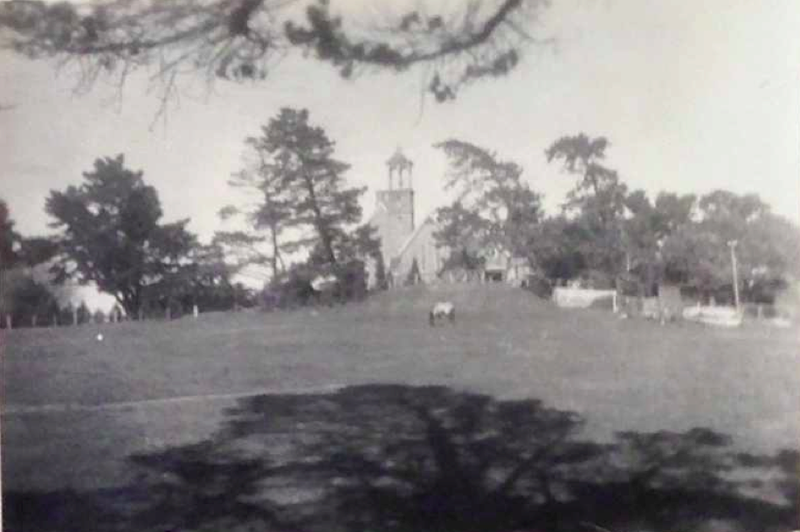 Ravenswood was purchased by the Catholic Church in 1890, and after additions and alterations it was opened and blessed by the Bishop of Goulburn, Bishop Lanigan in 1892. 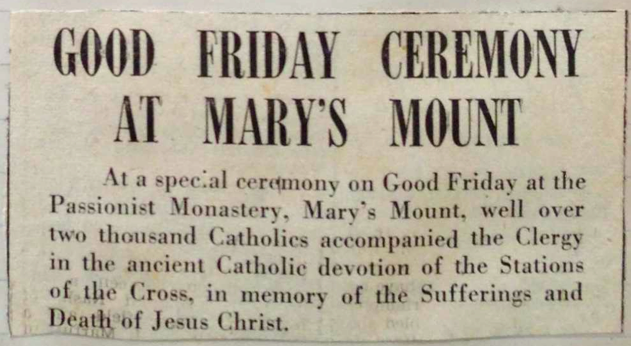 It was renamed Mary's Mount and became the home of the Passionists order of priests and novices. Today Mary's Mount after recent alterations and additions is a group of home units after some 70 years as the passionate monastery. On account of the confusion over the years it must be stated that there is no connection whatever between Francis Tait and the Reverend Andrew Tait, the Presbyterian Minister of St Andrews church Goulburn for over 23 years. This confusion was added to and has already been said as francis Tait came to Goulburn as a Methodist Minister. 'Kenmore', Parish of Narrangarril, County of Argyle, Land District of Goulburn, Eastern division of NSW. 1989. 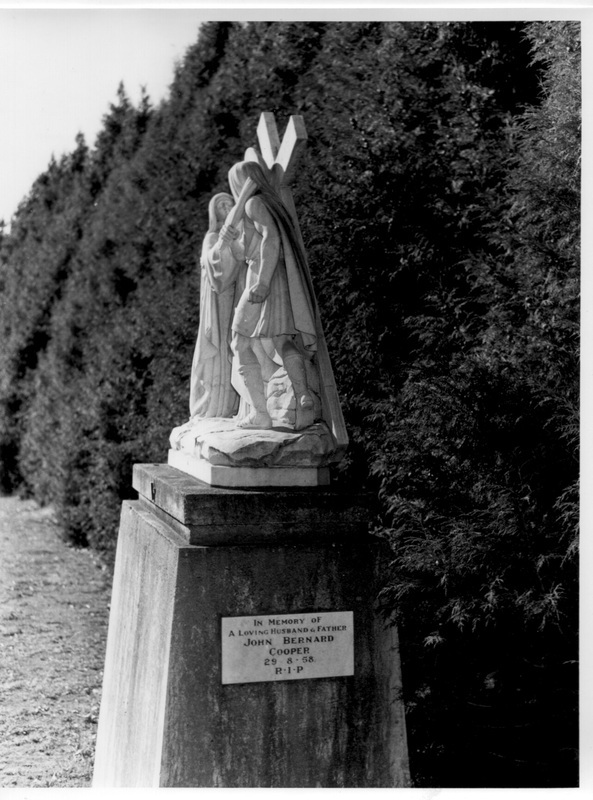 The religious order of men, only a short time after their arrival in Australia, purchased a property, 'Ravenswood', on the perimeter of Goulburn in 1890 and renamed it Mary's Mount. The house and land had been the home of Francis Tait, businessman and former Methodist minister who had it built about 1880. It was beautifully finished, with a fine cedar the staircase and ornamentation. 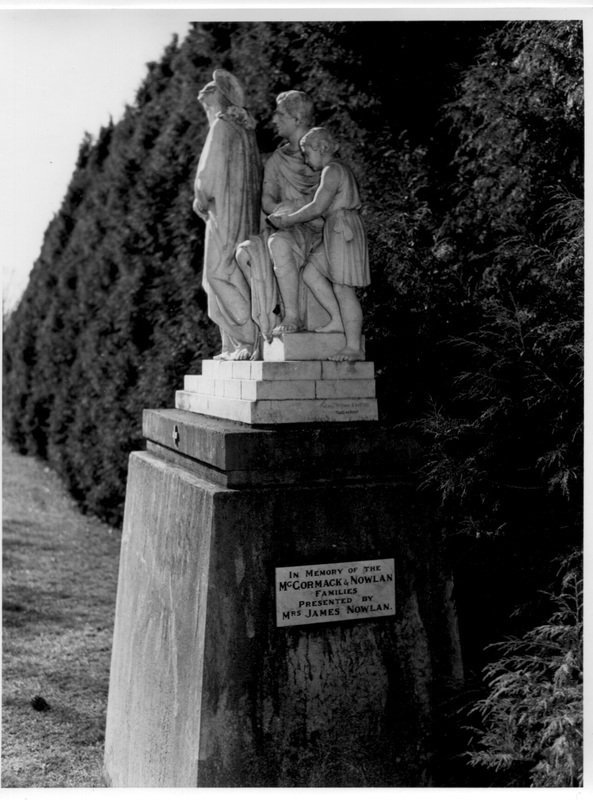 It was formally blessed and opened as a retreat of the Passionist Fathers on June 29, 1890 by Cardinal Moran. Early priests in attendance were Father Claimant and Father Hillary, who was rector in 1891. 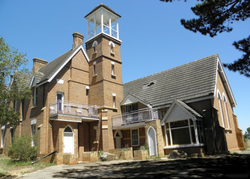 Almost immediately the novitiate building was begun with a house of study incorporated and the new building was blessed by Bishop Lanigan on 3 May 1892, the architect being the the E. C Manfred of Goulburn and the builder J. O'Brien. The occasional sermon was preached by Dr Gallagher who later became the diocesan Bishop. 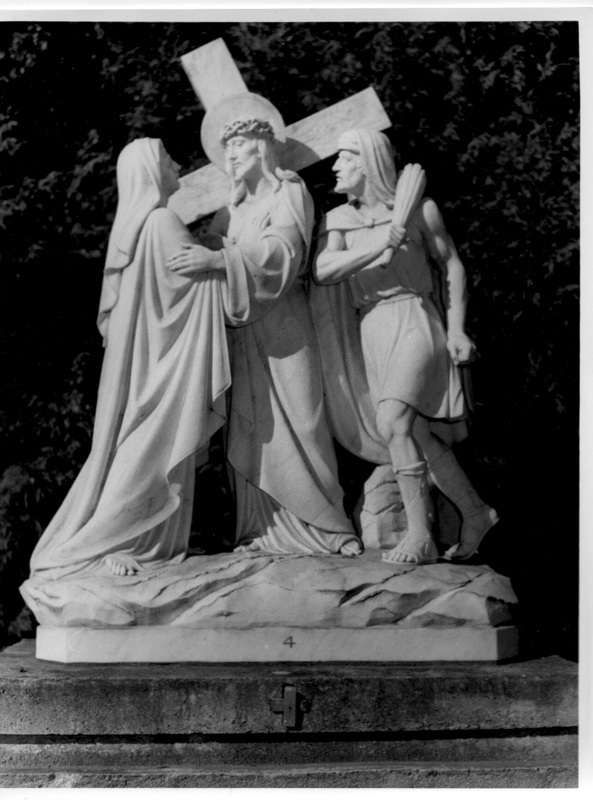 In the 55 acres of farmland and a fine garden area was developed and an Italian sculptor was commissioned to provide a large outdoor set of stations of the cross in Carrara marble. For many years they were the scene of a large assembly, up to 3000 people at a time on Good Friday. 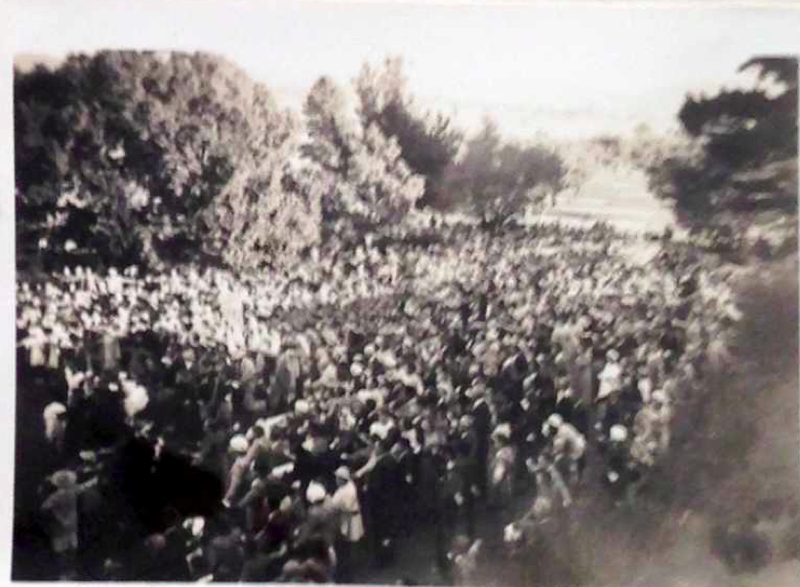 These grounds were also the scene of a Concourse of about 10,000 who came to see and to pray at the famous Fatima statue in June 1951. There were claims by a considerable number of people there that day of a strange solar phenomena in similar to those reported at Fatima, Portugal, in 1917. 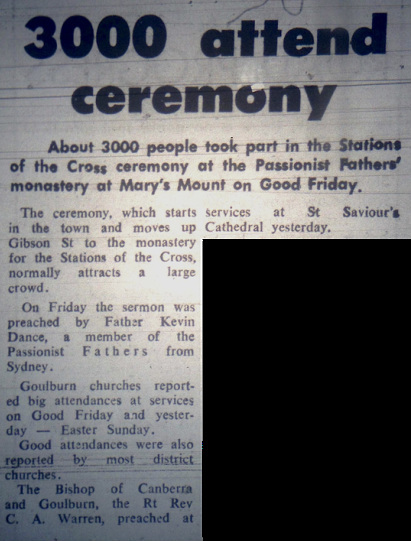 Goulburn [Catholic] Cathedral was regularly the scene of ordinations of Passionist priests. The group of seven was ordained in 1935 Anthony Herring, Xavier Bates, Pascal Sweeney, Augustina Fitzsimmons, Vincent McInery, Wilfred Spears and Placid Millay. 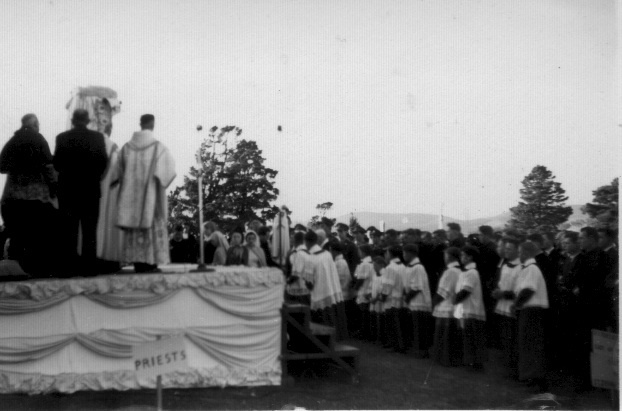 For many years these events established a close bond between the Passionist Fathers and the diocese of Goulburn. Several Passionist priests had particular links with the dioceses. Alphonsus Coen CP was from a well-known Yass family. In his many 'preaching missions' or 'supply' work throughout the diocese he richly baptised infants or received adults into the Church and had a propensity to bestow the name Alphonsus on unfortunate children who could not protest until years later. 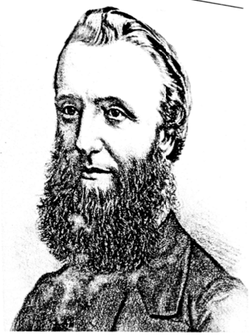 Another Passionist preacher Francis Clune was known to thousands of parishioners throughout Australia, not least for his Yankee beard, a custom rather rare among clergy of those days. His namesake, the famous Australian author, was a second cousin. Fr Clune's brother Patrick had been a priest of the Goulburn Diocese before becoming a Redemptionist priest and then archbishop of Perth WA. Patrick financed Francis Clune through his studies to priesthood. 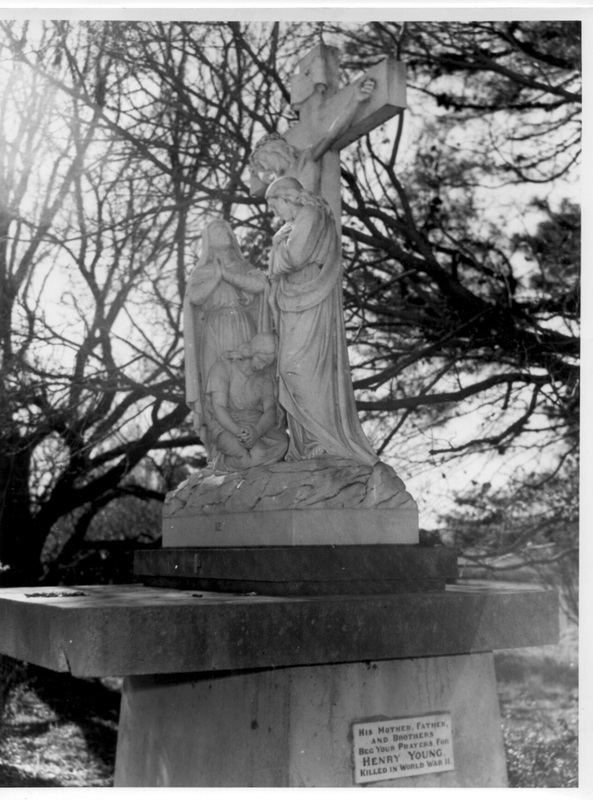 Francis Clune and other Passionist community members were buried in a cemetery plot at Mary's Mount, but their remains were later removed to Sydney. 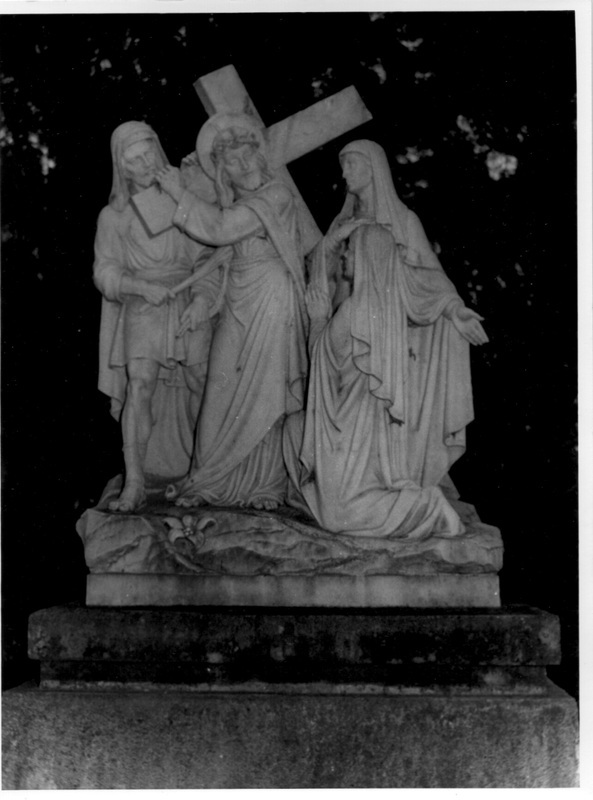 the Stations of the Cross were removed to St Michael's Novitiate of the Sisters of Mercy at Goulburn. Fr. 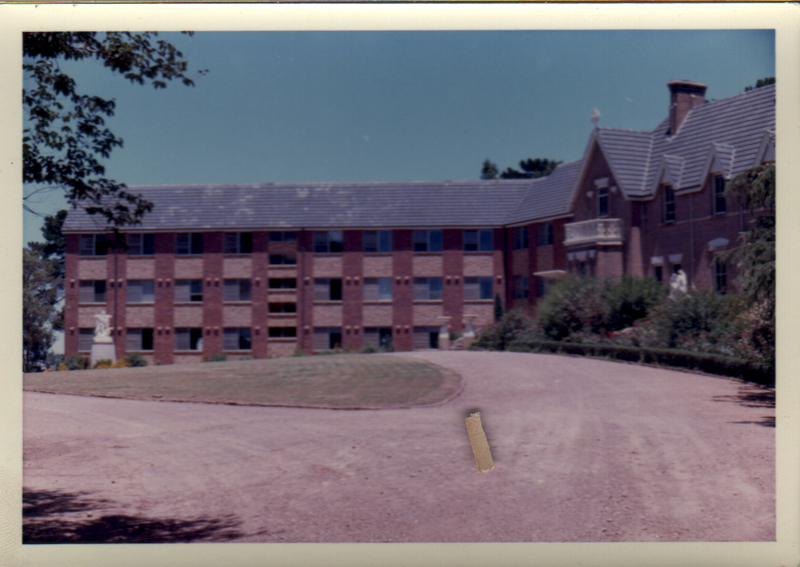 Gerard Mahony was appointed to Mary's Mount Monastery from 1955 - 1958 and again from 1969 - to its closure in 1972. He discusses the Passionists Mission and the life and times of his appointment to Mary's Mount. Fr. 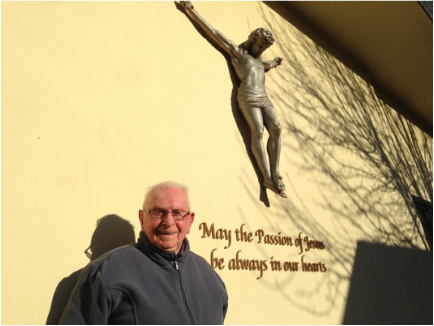 Gerard currently lives at the Passionists' Fathers Mother church, St. Brigid's, in Marrickville Sydney. Below are some pictures Father was showing me during our chat. The dates of some of these pictures are yet to be verified. Fr. Gerard, a passionate man still, at 91 years of age. 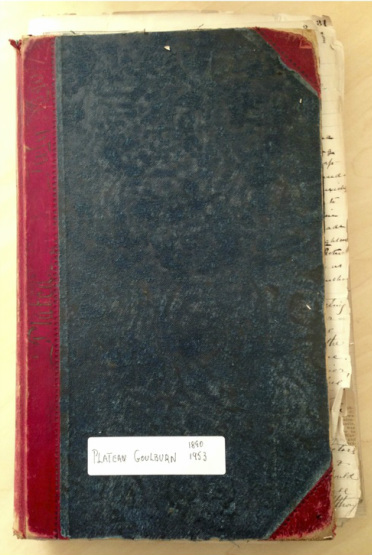 278 scanned pages of hand written notes detailing a unique and precious insight into life at the Mary's Mount Monastery. Also included are relevant newspaper articles of events at he Monastery and in the local area, from 1890 to 1953. Excepts of this text are reproduced in this history page. Opening of the new monastery. Buy a happy accident of fortune the date of the opening and blessing of the Passionists' new monastery or House of Retreat at Goulburn fell in with the visit to Goulburn of the Cardinal-Archbishop and the other prelates of our own and the neighbouring colonies, and the ceremony on Monday last was of a character calculated to give unqualified pleasure to the devoted Fathers and their friends of the clergy and laity. 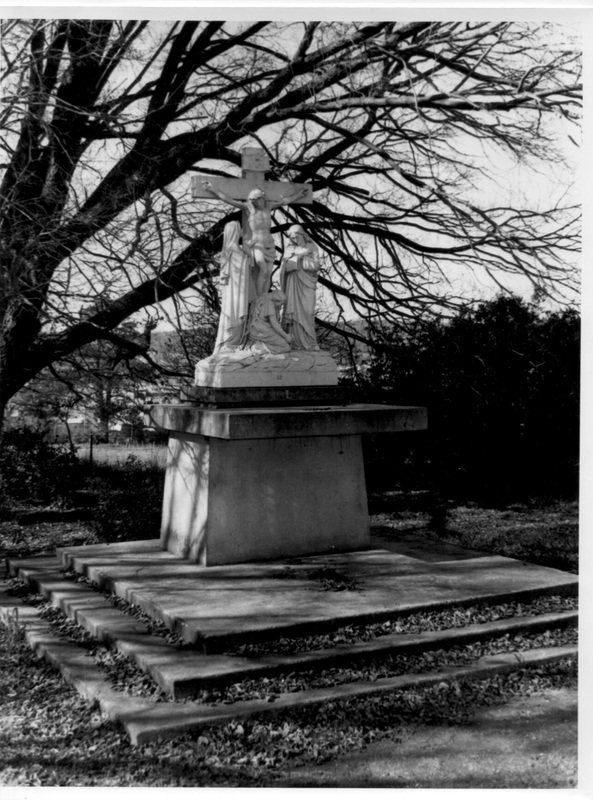 When the Passionist Fathers secured by a singular stroke of good luck the splendid house and grounds formerly known as Ravensworth, now re-named Mary's Mount, we congratulated them on the new this possession, and it is satisfactory to be able to state that all the visitors on Monday were enthusiastic in their expressions of admiration. and was selected from the pick of the celebrated Kenmore Estate 10 years ago; about 2 miles from the city, and with it grounds, gardens, lawns, shrubbery, orchard, and vineyard, covers and area of over 38 acres. 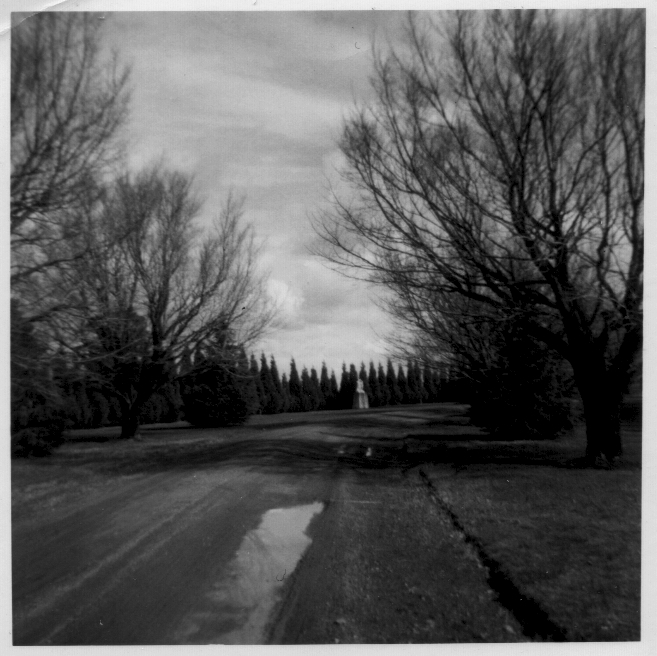 The approach by the lodge is through an avenue of ornamental trees and shrubbery, and the house stands on a terraced plateau commanding a series of the finest and most picturesque panoramic views that could be will imagined – city, playing, Valley, and Cookbundoon ranges – a variety of scenery at once most attractive and pleasing. The pre-lights who took part in the opening ceremony were the Cardinal–Archbishop of Sydney, Bishop Lanigan of Goulburn, Archbishop Carr of Melbourne, Archbishop Reynolds of Adelaide, Bishop Murray, Maitland; Bishop Torreggiani, Armadale; Bishop Reville, Sendhurst; Bishop Byrne, Bathurst; Bishop Dunne, Wilcannia; and Bishop Doyle, Grafton. Bishop Higgins having to return to Sydney, could not attend. Besides four Passionists, Very Rev Alphonsus O'Neill, C.P. (Superior), Father Marcellus, C.P., Father Coleman C.P., and Father Hillary, C.P., 21 priests assisted. All the prelates and clerics drove from Goulburn early in the afternoon to the monastery, and the line of vehicles attracted no little attention as it passed through the city. After the blessing Father Alphonsus entertained the visitors and the proceedings ended with showers of congratulations on the sons of St. Paul of the Cross. [...] Full text can be found on page 4 of The Monastery Diary. I arrive by train about 2 o'clock on the morning of the night of the present month (August), and never perhaps, have I experienced such a change in the shape of refrigerating. I went to visit Mary's Mount, the present noviciate of the Passionist Fathers. The fathers had, even at the unearthly hour of the night, sent a buggy to meet me. The rain and sleet came down, and the cold west winds were a terror to me. 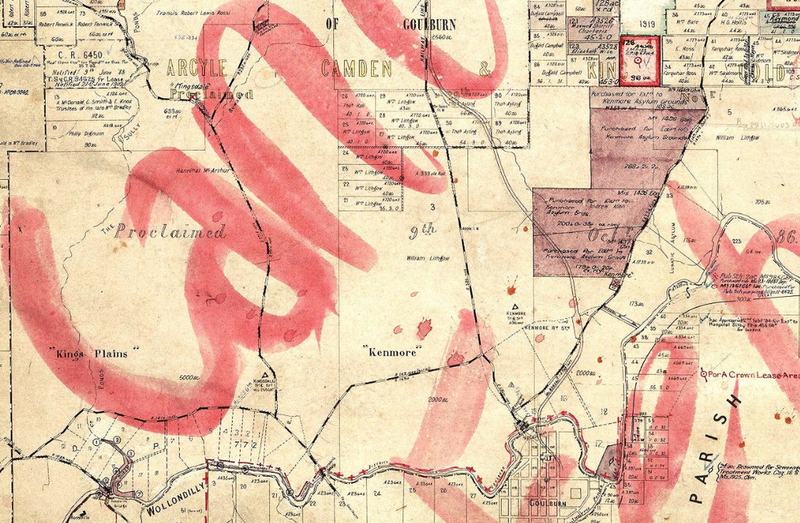 The driver, whom I found to be not only are most obliging young man, good tempered and good-natured, as might be expected, from a man who would turn out under most unusual circumstances, was an old Queenslander. The various questions he put to me concerning Brisbane people helps to revive the monotony of the journey to Mary's Mount. After a somewhat anxious drive, for we pelted away through mud and rain, he said, "This is Mary's Mount, and you can stop here for the night," showing me to a neatly kept and spacious lodge. It required but little to urge me to bed, and in a few minutes I was in the regions of dreamland, and thought that little of the whistling sleet or blinding rain. Just before my arrival the Matin bell had rung, and the community were engaged in chanting the sublime office of the Church. Two o'clock is not an uncomfortable hour to be summoned, but the Passionists, faithful to rule of the great founder, are accustomed to rise at that hour. When morning broke, the rain had in a measure ceased, I winded my way to the House, where the masses had already commenced. Nothing could exceed the welcome I received from Father Hilary, who is now in charge of the House. Many in north Queensland will remember him from his missionary zeal and he's accomplished sacred oratory. Of his Queensland trip and the kindness of the northern people he always speaks with pleasure. In this house of the Passionists the primitive role is obsurved in its entirety and in its austerity. They have no eight hours a day here; but of the 24 they devote 15 hours to the duty of their life. About one hour and a half is given to recreation, and, with the exception of this time, and absolute silence and religious or prevails throughout the entire House. I was glad to meet at Mary's Mount the distinguished father Alphonsus, who is the superior in Australia, and who gave a mission here some 12 months ago; I also made the acquaintance of Father Clement. Father Alphonsus is an old man, but it is surprising the work which he can go through with youthful energy in a single day. Here is a man, when most men of years are retiring from active life, full of work, which must entail some amount of anxiety; but he is accustomed to a life of labour, and he is never so well as when he is in the thick of it. The tourists who I have before quoted mentioned Roseville. Well to the north of that place is Mary's amount, so called from the fact that on the feast of presentation present body of Passionists arrived in Australia. 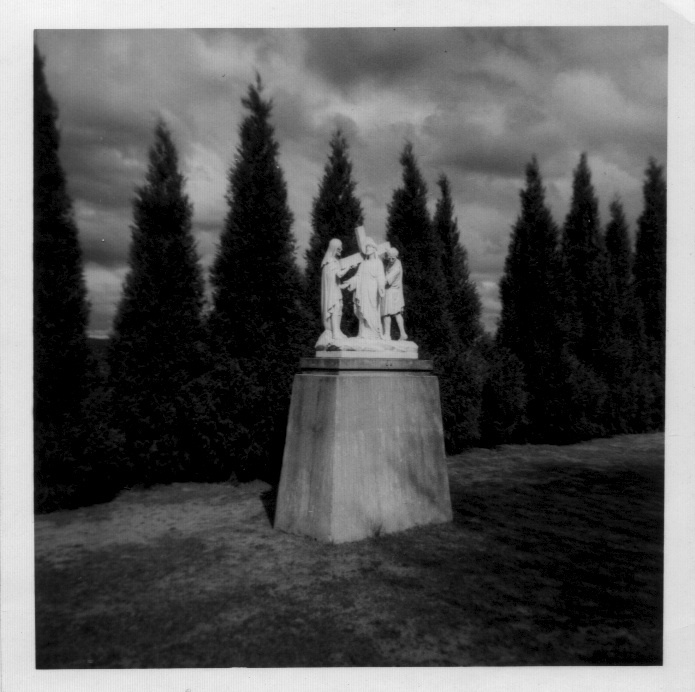 There were Passionists here before, and Strasberg Island has given as a grant from the crown to the Italian Passionists for the training of the aborigines, but the grant lapsed. The spot where Mary's Mountain situated has no equal in Australia for a religious house. It is, I should say, about 2 miles and a half from the railway station, and is of sufficient elevation so as to be visible from nearly all parts of the city. It was built about 10 years ago by the Rev. W [?] Tait, a Wesleyan minister who had retired from the ministry. The house is replete with every modern improvement. It's rooms are spacious and gorgeously fitted with marble mantel pieces, mouldings, gas chandeliers, etc. The staircases are on a magnificent scale. No expense was spared by the man who built it. The grounds are elaborately laid out in terraces, which must have cost an enormous sum. The Passionists, I learn, do not intend changing the present house, as it will be kept for priests and layman who go into Retreat, as they do at present under the guidance of the Fathers. They are building a new wing, which will be no doubt more to the wishes, as it will not contain the luxurious fittings of the present house. A chapel and choir are to be added, and when this is complete a few days spent there will be a pleasure to visitors. Looking eastwards, although the grey clouds were lifting themselves, we could see the city of Goulburn, sloping in the distance, and beyond "the Mountain limestone caps," on which a survey's mark placed, and which, at a distance, resembles a cross. This mountain the novices, not inappropriately, christened Mount Calvary. 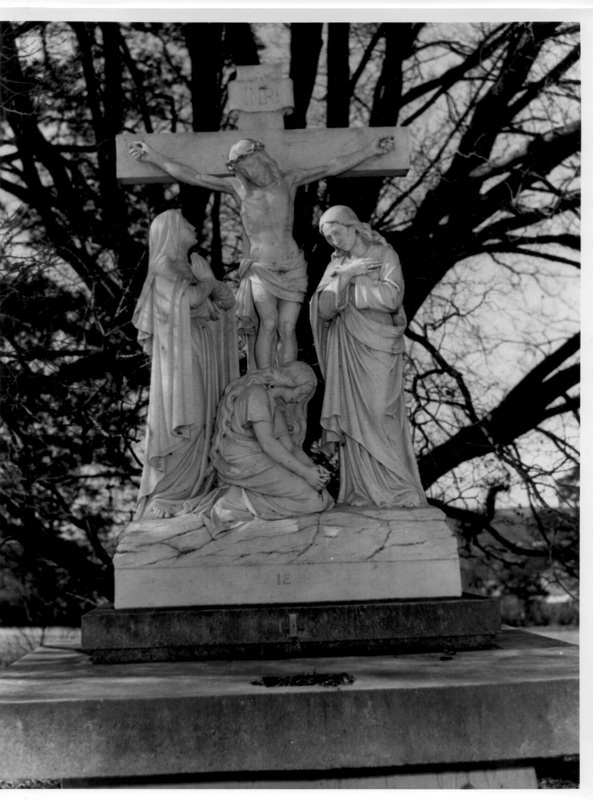 When man's was finished, as I watched the novices leaving church, I thought of lesson call of the cross, how he gathered round soon, meaning of almost every land, but to me the exquisite and joyous pleasure was in store at singing that not only had the good sweet old Saint brought under the folds of his mantle the religious minds of old Christian lands, but he had captivated by his sweetness, he's gentleness, and his love, the pink and flower of young Australian youth. The procession I saw before me pass reminded me of the beautiful passage of Lacordaire describing the movement of the religious, through the corridors of the Dominican convent. 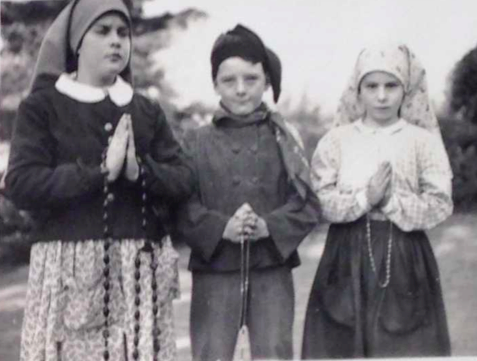 It was not use alone that were numbered among the new novices; there was a priest, who, after many years of missionary life, had just put on the habit and sandals of a Passionist. 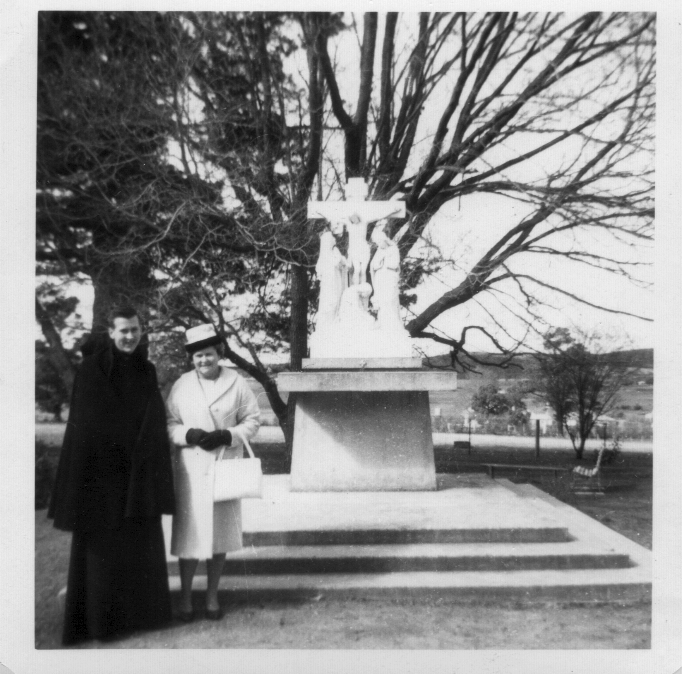 Being the feast day of Father Alphonsus, visitors had permission to converse in the grounds with the community. The Australians I made my entire study. I could scarcely even credit that, with all the luxury and ease in which Australian boys were bread, they should ever settle down to a life which requires so much sacrifice, and one which is so much out of the life to which they had been accustomed. But there they were, fall of the great spirit of the order, full of the future of their own beloveds land, young men who had exchanged everything for the habit of one of the most glorious missionary saints of the Church. The primary object of it is to train priests by constant exercises of the spiritual life, so that they may be able to impart the light of truth, faith, and hope to lost souls. About 3 o'clock in the rain had cleared away. 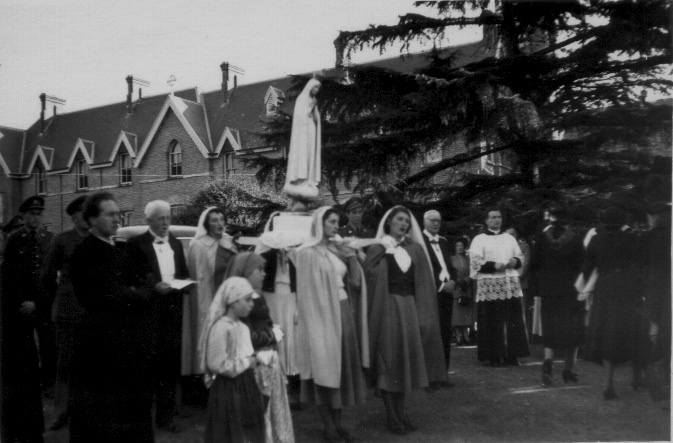 The community recite daily the Rosary along the beautiful garden walks, surrounded by rows of pine trees and shrubs, a banner of the Blessed Virgin being carried in the procession. Towards evening the Vespers are sung in choir, and the Benediction of the blessing sacrament follows, the voices of the novices being exceedingly beautiful. A short time after, the religious retire, but rise from their slumbers ere the morning sun appears to sing again the glorious Matin Office of the Eternal Church. In the early morning, cold and bleak, the driver was again ready, not before the good Passionist brothers had prepared breakfast. As the train speed away from the city, that to my mind contacting is so much of the present and future glory of religion in Australia, I wistfully looked over the hills, and saw Mary's Mount disappear, and the dark hills beyond - not for ever, for the invitation was again extended to me, as well as to every Queenslander who chose to stay on the journey and partake of the hospitality of the children of the generous old men who prayed and watched for the future destiny of his Order amidst sobs and tears on the lonely heights of Monte Argdntaro. is expressed by penance and suffering. 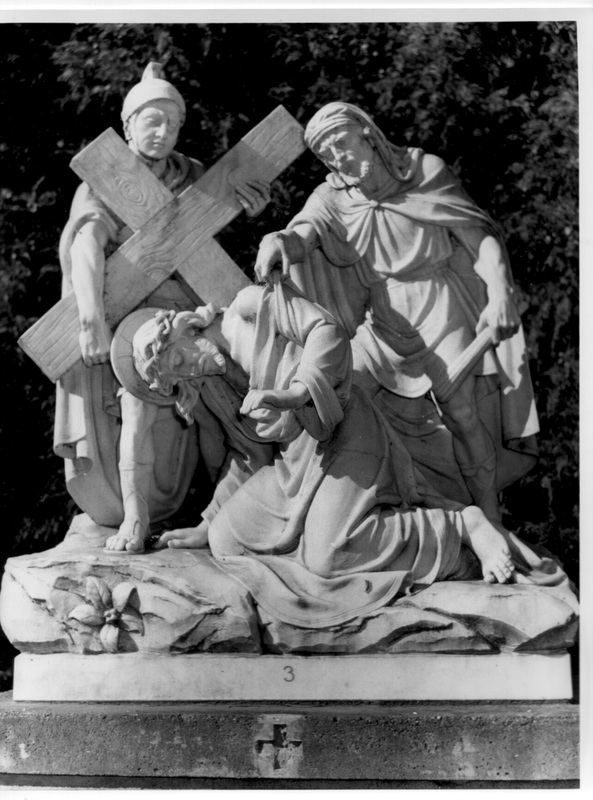 On the 22nd November, 1720, St Paul of the Cross was first clothed in the habit of the Passion, and assumed the name "Della Croce." He occupied a "cell " in a hermitage on Mount Argentaro. 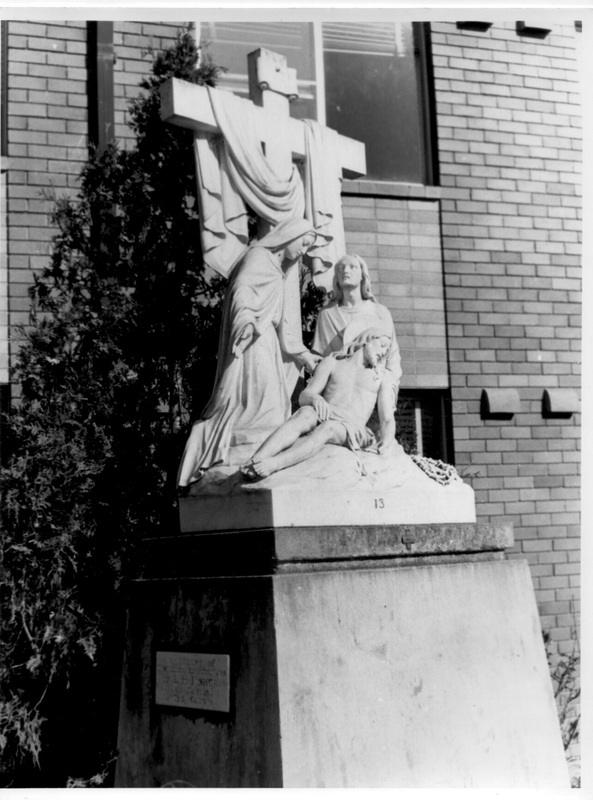 This was the first house of retreat of the Passionist Order, and it flourishes to this day. Paolo then received from Pope Benedict XIII the privilege of founding an Order of missionaries with the object of preaching the love of Christ as displayed in his passion. Paolo and his brother Giovanni (who bad joined him in the work of the Order) were ordained priests in Rome on the 7th June, 1721. The rules of the Order have been approved of by no less than four Pontiffs, namely, Benedict XIV, Clement XIV, Pius VI, and Pius VII. 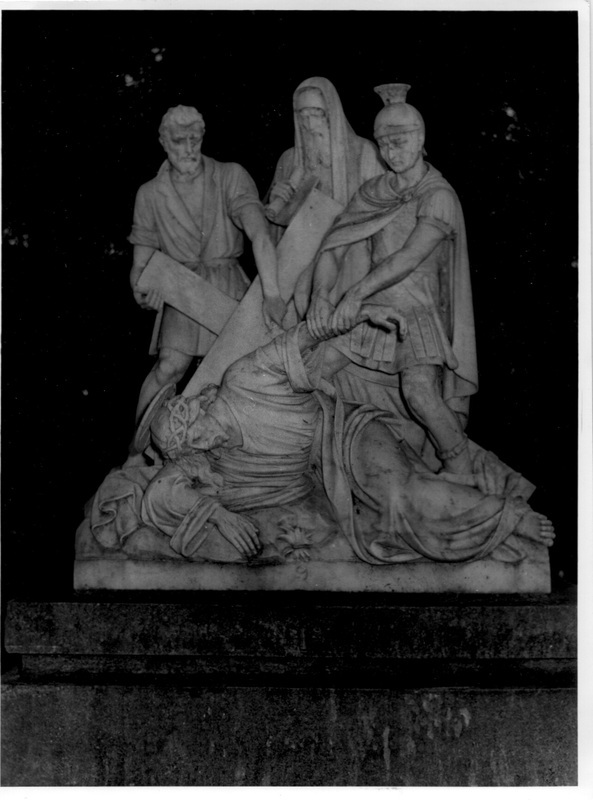 After seeing the Order spread throughout Italy, St Paul of the Cross died at the Retreat of the Saints, the first monastA3ry of the order, on Mount Argentaro. He was beatified in 1852, and canonised in 1867. The carrying out of the special work of the Passionists is done principally by the conducting of missions and retreats, on the invitation so to do from the bishops and priests of different parishes. After their apostolic labours the Passionist Fathers retire for a short rest to their monasteries, or retreats as they are called. These retreats are generally selected with a view to quiet and solitude, and in this respect the building at Mary's Mount is admirably situated. known in the great Cardinal's Apologia pro Vita Sua. situated at Broadway in Worcestershire. 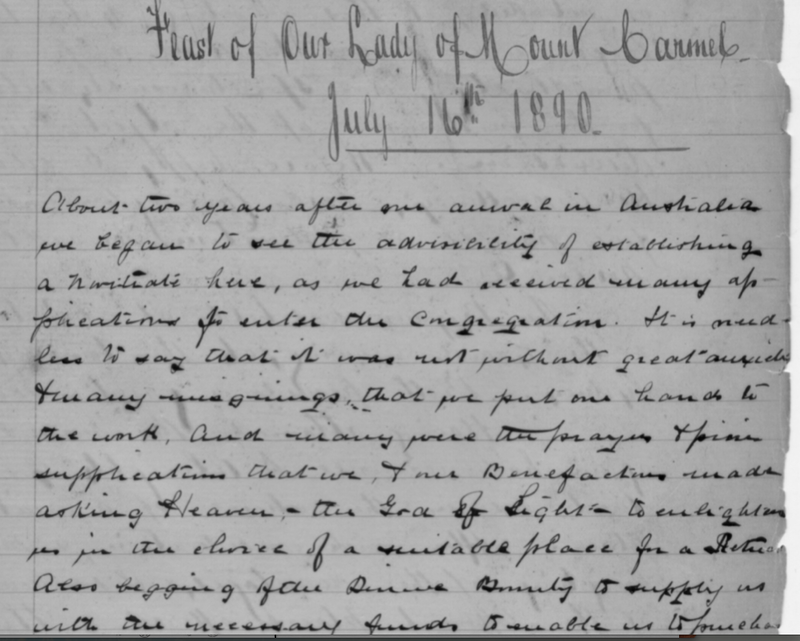 next week after a stay of sixteen months) was Head Superior in England when his Eminence asked for the missionaries for Australia, and knowing the great field for missionary work which this country afforded he accepted the invitation, and the first community of Passionists arrived in Sydney on November 21st, 1887. The 21st November is a feast known in the Catholic calendar as "The Presentation of the Blessed Virgin in the Temple." Hence it is that the monastery at Mary's Mount is called the Presentation Retreat. 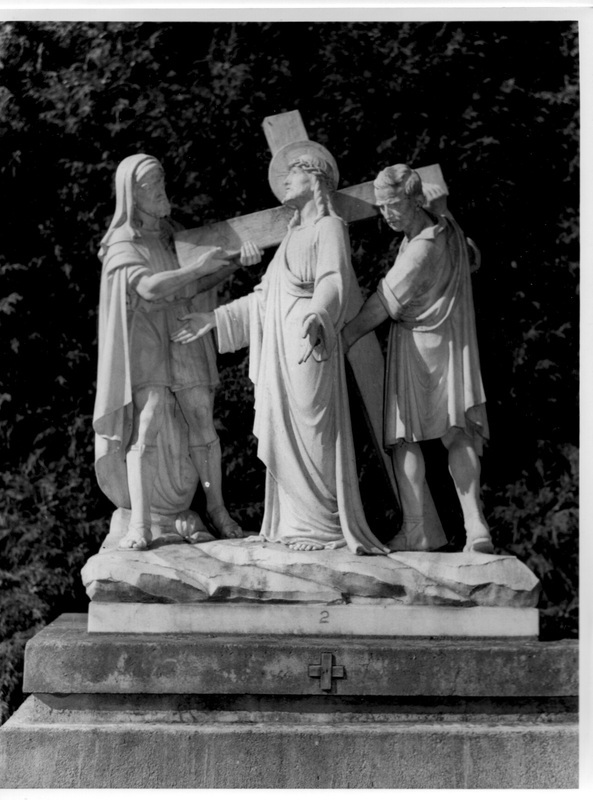 St Bridget being attended to by those of the four priests not employed in missionary work. 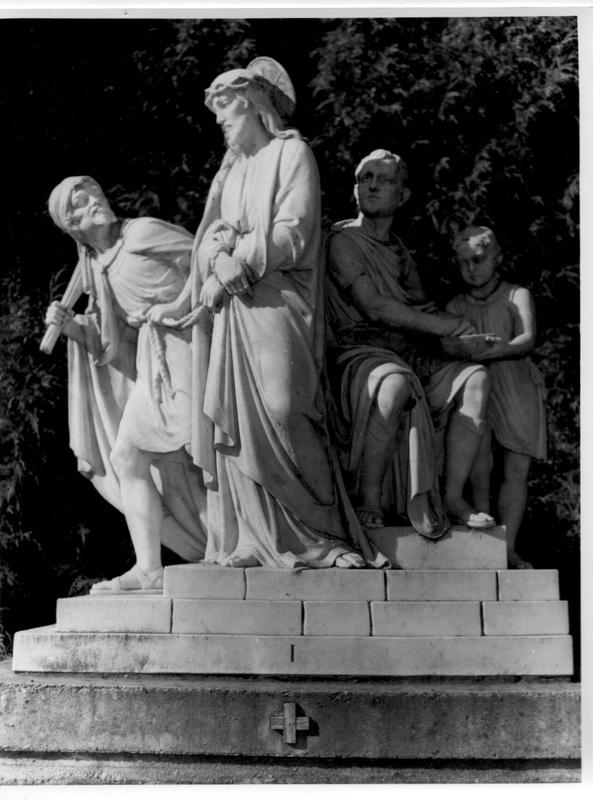 Fathers by other Pasisionists from Rome. Consequently seven priests, two students, and one lay Brother have at different times arrived from the English province, amongst these being that scholarly and eloquent preacher, Father Hilary, who is at present master of novices at Mary's Mount. time all concerned would be able to judge of the probationers' fitnessfor the Order. In this aptitude, together with the desire for the religious life, consists of what is known as the vocation. 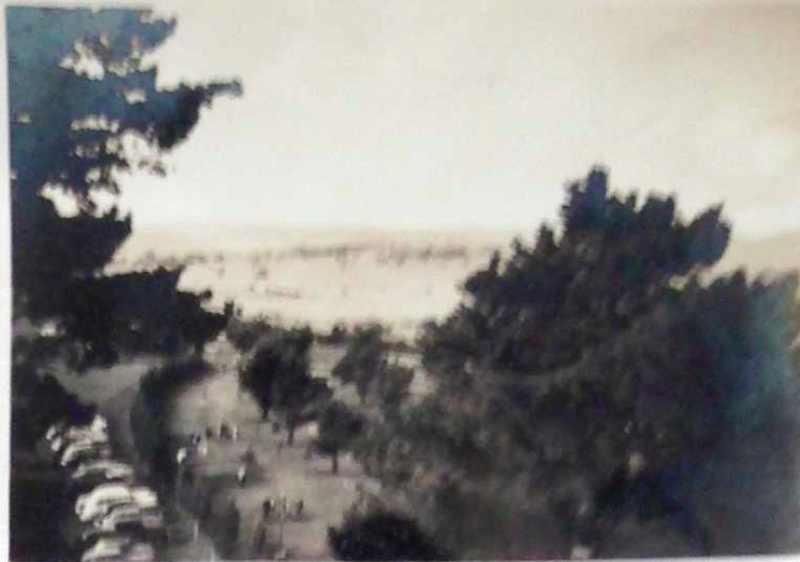 and the Ravenaworth Estate, overlooking the city of Goulburn, and at that time in the market, was selected as affording all the conveniences required for a novitiate house. 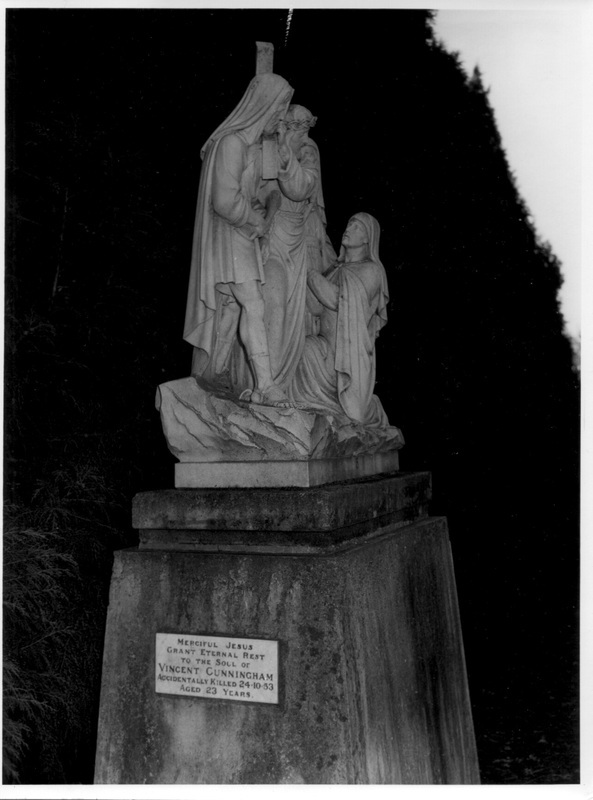 After the usual formalities the purchase was effected in the early part of 1890, and Havensworth, as before stated, became known as Mary's Mount, and the first noviciate of the Passionist Order in Australia was established in Goulburn. by his Eminence Cardinal Moran, in the presence of many dignitaries of the Catholic Church, including Archbishops Carr (Melbourne) and Reynolds (Ade!lade) and the bishops of Goulburn, Maitland, Bathurst, Grafton, Armidale, Wilcannia, etc. 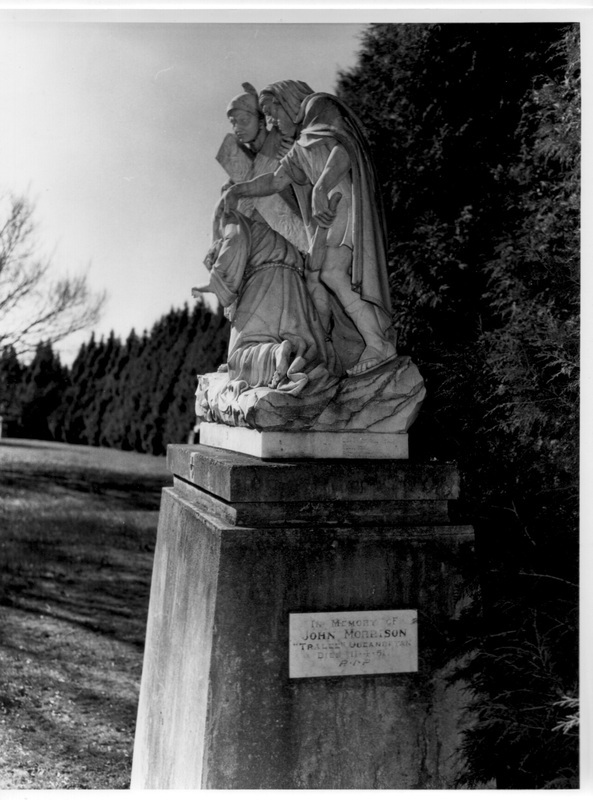 Mary's Mount five young Australians have passed the year of probation or novitiate beneath its roof, and are now engaged in the studies, necessary for the work of a missionary priest. Their places in the noviciate portion of Mary's Mount were quickly taken by other aspirants to the priesthood of the Order, and this increase in numbers necessitated the addition of the new wing and chapel which were blessed and opened yesterday. 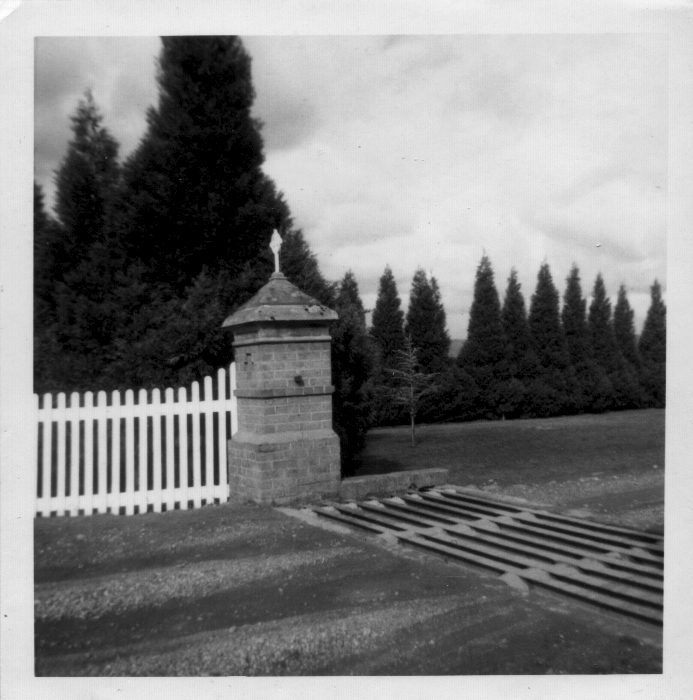 Three miles distant from the town of Goulburn, crowning the summit of a pineclad hill, is the Passionists' novitiate and monastery. From the green-terraced plateau on which the monastery stands, a magnificent panorama is outspread to view —city, valley, undulating plain, winding river and purple, range. 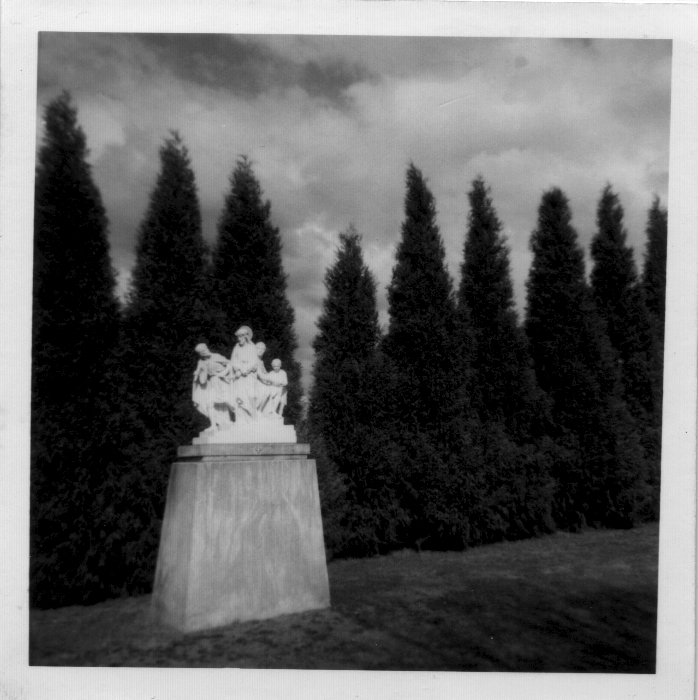 The extensive grounds surrounding the monastery are beautifully divided into orchards, gardens, shrubberies and cultivated fields, with long belts of protecting pine trees. The building, in style domestic Gothic, is a splendid structure, and stands in a picturesque framework of flowers and shrubs and tapering fir trees. High over all is the graceful tower containing an octave of tubular bells, melodiously sweet and subdued, suiting the quiet of monastic life. These chimes were originally imported for the Sydney Post Ollice, but unsuited for the clang of the city, they found a more congenial home at the monastery at Mary's Mount. Those bells peal out their sweet melody many times during the day - and in the still hours of the night, for the Passionists at Mary's Mount follow the strict monastic rule of chanting in choir the Divine Office. Two hours after midnight they rise from their pallet of straw to chant the glorious Matin Office of the Eternal Church. Shortly after 3 a.m. they retire, to rise once more at 6 for prime Mass and an hour's mental prayer. During the rest of the day they observe the other canonical hours with the daily round of prayer and praise. About six hours in all arespent each day in the chapel, the rest ofthe day being taken up with study and spiritual duties. Wednesday. Friday and Saturday in each week are fast days, and the first meal each day is taken at 12. 30. a cup of coffee and a little dry bread forming the breakfast. 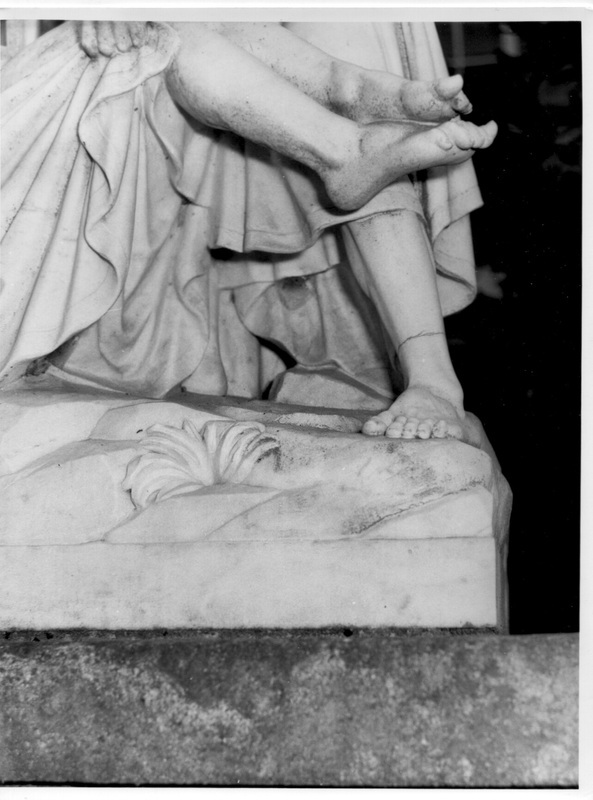 The religious go barefooted, even during the severe winter months of the Goulburn climate and the long midnight and morning offices. The end that Passionists propose to themselves is the dedication of their lives to God for the sanctification of their own souls and the salvation of the souls of others. In the seclusion of the cloister they prepare themselves by study, devotion and meditation for missionary work among souls in the outer world. 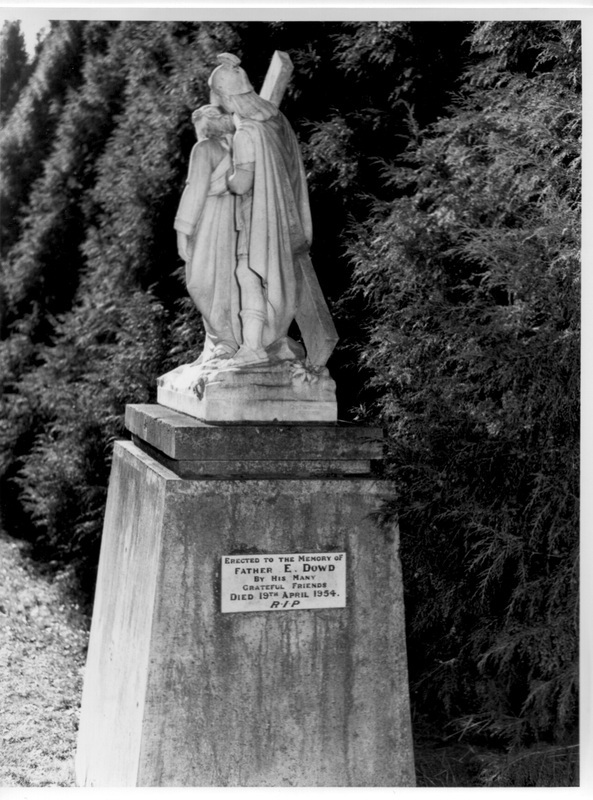 Last year the novitiate was reopened at Mary's Mount, for many young Australians, won by the sweet attractiveness of the spirit of St. Paul of the Cross, wished to place themselves under his mantle. Sunday last witnessed the impressive and pleasing ceremony of the profession of five of those novices. 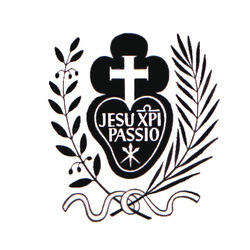 The function began with the blessing of the badge, which is worn by every Passionist over his heart, but is given to a novice only on the day of his profession. This badge, as also the habit, was shown by Our Blessed Lady to the Founderof the Order, St. Paul of the Cross. It is a distinctive and beautiful badge, consisting of a white ivory heart surmounted by a white cross. Inside the heart are the words:'Josu Xpi. Passio,' which mean. Passion of Jesus Christ. The Passionists take avow to promote devotion to the Passion ofChrist. After the blessing of the Sign, aneloquent sermon was preached bv the Very Rev. Father Athanasius, the Provincial of the Passionists in Australia. At the conclusion of the sermon, a solemn and moving ceremony took place, the novices in sandal-led foot, and clothed in long, black habits, with Andalusian mantles, prostrated themselves on the pavement of the chapel; apriest, vested in white alb and purple stole, read aloud in English the touching Gospel story of the sufferings and death of Jesus; meanwhile, overhead, the dead bell tolledin the tower. These five young Australians wore dying to the pleasures of theworld to live to Jesus Christ. Some of those present were moved to tears, but they admitted afterwards that they were alltears of joy. At the conclusion of the history of the Passion the novices one by oneknelt at the altar of God, and made their profession as Passionists, and consecrated their lives and their services to God by the vows of religion. 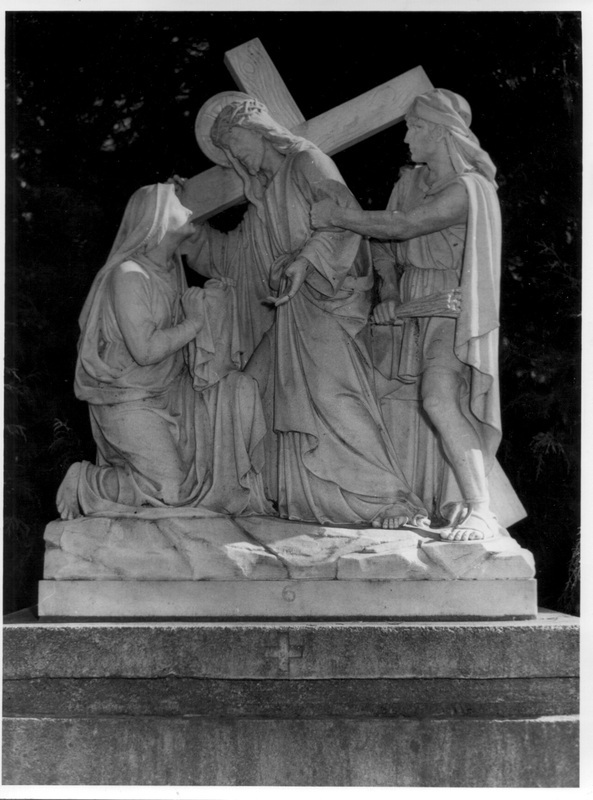 A wooden cross was then placed on tho shoulders of each of the newly-professod, and a crown of thorns on hishead, for they are called to be followers of the crucified in truth and reality, and their mission is to carry the Cross whithersoever they go, and toll the story of the infinite love of a crucified God. The ceremony concluded with Benediction of the Blessed Sacrament, the music being beautifully rendered by a special choir under Miss Caspcrs, from Goulburn Cathedral. As we wended our way homewards, westopped to look back at the monastery, sinking into the deepening shadows of nightfall, and we thought wistfully of those who had chosen the bettor part, and whispered a prayer that the Passionist Fathers at Mary's Mount may gather many more Australians into the hallowed walls of their monastic home. The names of the newly professed are: Confratres Michael, of the Seven Dolours (O'Donnoll); Bonaventure. of the BlessedVirgin (Thorn); Stanislaus, of the BlessedSacrament (Cross); Thomas, of the SacredPassion (Mackenzie); Dominic, of the Dolours of Mary (Ouvrier). The first local air crash appears to be that of a Sopwith Dove plane making a forced landing at Mary's Mount in March 1934. 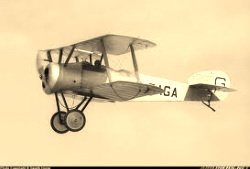 The plane was owned by Mr Howarth of Narrandera and piloted by Mr R. G. Whitbread and Mrs Howarth as passenger. Neither was injured but the plane was raped and a half of the damage propeller is now on show at Saint Clair. From the early 1930's planes were becoming more commonplace and passings and landings attracted little attention. The Passionist Monastery at Mary's Mount, with a panoramic view of practically the whole of Goulburn, is a fitting site for the ceremony in honour of our Lady of Fatima yesterday, went over 10,000 people attended, coming from Goulburn Canberra, Captain's Flat, Yass, Wollongong, Campbelltown, Cowra, Young and Sydney by train, car, bus and on foot. Never before have such scenes or numbers being witnessed in Goulburn. 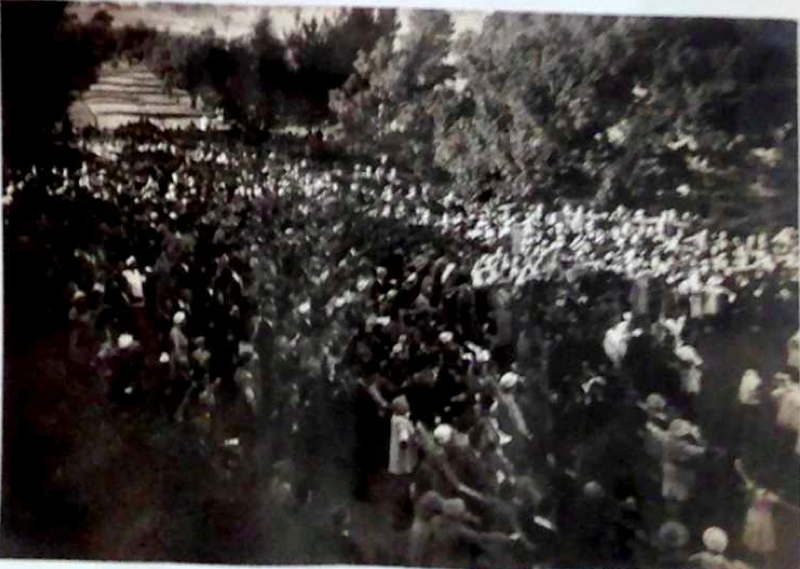 Approximately 8000 people marched in the procession in them Monastery grounds, while it is estimated that another 2000 were among onlookers, the sick and their attendance. Members of the pilgrimage party said it was the first time during their worldwide travels that they have been reminded vividly of Fatima its self. It was the culmination of remarkable demonstrations of faith by the Catholics of Goulburn during the past week, when crowds have gathered wherever of the world famous statue of our Lady of the Rosary of Fatima has been enthroned, throughout the city. Very heavy fog which had hung over the city for most of the morning cleared, leaving an afternoon of warm sunshine. The procession took over an hour and a quarter to pass a given point, and was four deep a quarter of a mile being traversed from start to finish. The three – mile trip from the city was made by a continuous stream of pilgrims, reciting the Rosary. They made the journey on foot–in the true pilgrim spirit – thus joining in the world wide effort to obtain peace, and from a returned to penitence and prayer. This is being done as a result of apparitions three shepherd children at Fatima, a little village 70 miles north of Lisbon, in Portugal, in 1917. Most of those who walk went by Gibson Street, over the Wollondilly. Most people were covered in clouds of dust from the extremely heavy traffic. 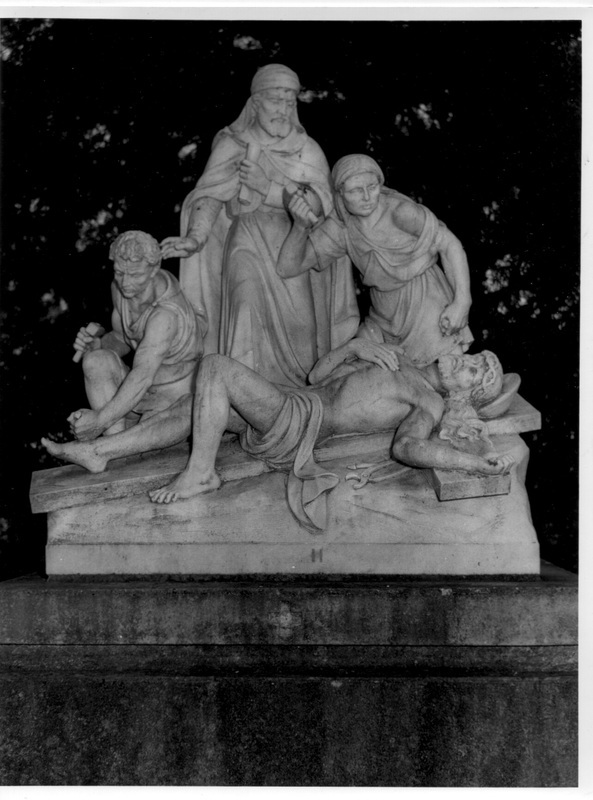 Thousands went to Mary's Mount by car, bus, Jeep and truck, while the very sick were taken by ambulance, to receive the blessing of the sick. Many non-Catholics took great interest in the ceremonies and there was an atmosphere of quiet, but intense devotion throughout. During the whole of the procession. Rosaries were recited, and hymns sung. Groups of children from 28 catholic schools marched in the procession, in addition to representatives from 16 parishes. About 3000 visitors came from distant centres, some making a 200 mile return trip by bus. Police stationed at different points controlled the traffic., And on the grounds, sections were marked off for the various groups. The statue of the "pilgrim Virgin of Fatima, was carried by four Children of Mary, while cadets from R.M.C. Duntroon and St. Patrick's College formed a guard of honour. To papal nights, Mr. J.C. Walsh, K.C.S.G., Of Goulburn and Mr. J. Brophy, K.C.S.G., Commonwealth Auditor General of Canberra, completed the guard of honour. Although, they were 91 different group's marching, many with coloured banners of schools, solidarities and parishes. 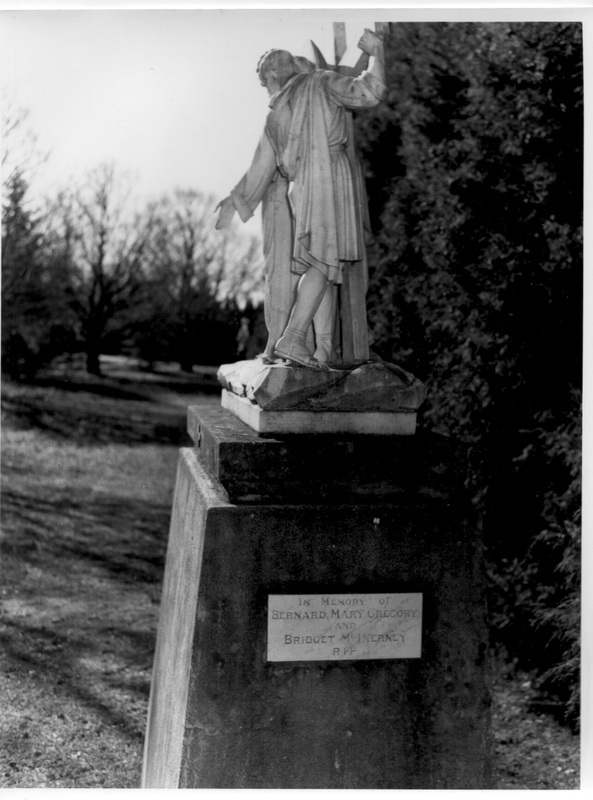 The statue of the virgin was placed on a beautiful shrine on the grounds. Nearby and alter was erected for the Pontifical Benediction of the Blessing Sacrament. Three small children, representing Lucia, Jacinta and Francisco, the three Shepherd children, Milts before the shrine right throughout the ceremonies, and formed a tableau on the procession float. His Lordship, Dr. Young gave the benediction of the Blessed Sacrament, while the Deacon was Rev. Fr. Alphonsus, C.P., Provincial of the Passionists Order. 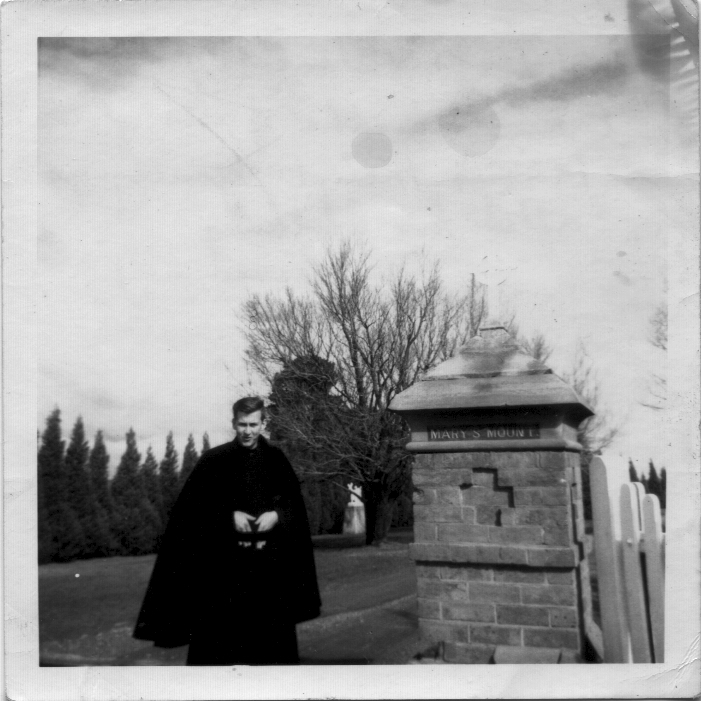 Father Celuis Kelly, O.F.M., Superior of the Franciscan Fathers, from Maryfield, Campbelltown, was Sub-deacon. His grace, Archbishop McGuire, Monsignor Giles, of Sydney, and Monsignor Don Santos, of Fatima, were also present at the alter. Hey particularly impressive site was the vast mass of people, kneeling on the ground with arms outstretched, praying in unison, while His Lordship is, Dr. Young, carrying the monstrance containing the blessing sacrament, went around among the sick and in firm, blessing them individually. There were very touching scenes during this time, when many people wept. The ceremony lasted half an hour, between 80 and 100 people receiving the Blessing of the Blessed Sacrament near the statue of our Lady of Fatima. In his inspiring address, his Lordship, Bishop Young said: "For the past few weeks the lovely pilgrims statue of our Lady of Fatima has been carried through our diocese, and thousands have gathered before it, to think of the Fairest Daughter of our race, the Mother of our Lord and Saviour, Jesus Christ, and of the message and warning that she brought to our sad and frightened world is 34 years ago. Already it has acted as the focus of the attention and devotion of millions in 33 different countries. 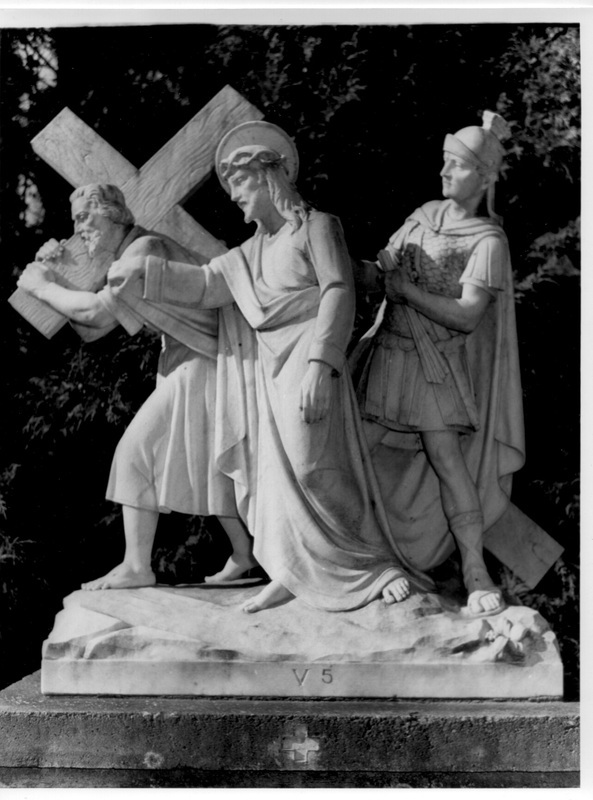 "In the centuries of long ago, the cross was carried among the peoples of Europe, and mean rallied around it, and their imaginations were seized and their faith activated, and they marched to the Crusades. 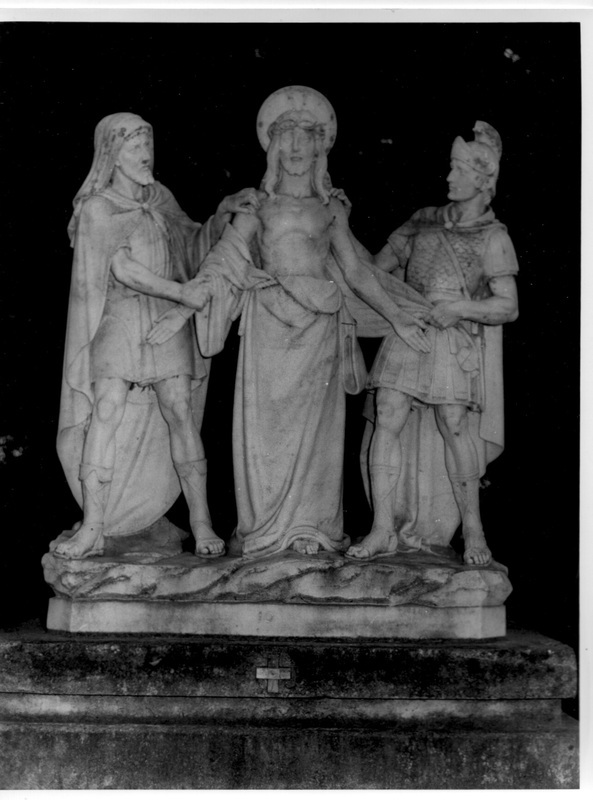 This statue has journeyed, not to rally warriors to arms, but to call men to a supreme effort of the spirit that peace may come to our menaced world." "There is a doctrine running through the minds of thousands today is, that man is nothing but a superior kind of brute, who's spring of action is not a free spirit, but food and goods, and the way they are produced and exchanged. In precisely the same year –1917– win this doctrine was first put into ruthless revolutionary action in Russia, God, by a simple gesture of His almighty power, re-emphasised the supremacy of the spiritual and the mastery of May. He willed, as He had done before at perilous periods in history, that the most perfect creature of the human race should manifest Herself, and reiterate that in His revelation, which met and rebutted the current dangerous error. Mary, His mother, appeared to the simplicity and innocence of childhood on the quiet sheep pastures outside a village 70 miles north of Lisbon." This was no hallucination or illusion; it was and authentic intervention by the God who guides the destiny of man. "The seal of its validity was stamped across the very heavens, and 70,000 pious and impious alike, witness the Divine signature as the sun through off its multicoloured lights. When, and appeared to come hurtling towards the earth. "If the evidence for that phenomenon is rejected, then let us be logical and scrap all our history books, and throw the laws of science into the discard. "By this simple act of his power, God laugh to scorn the ponderous lucubrations [slow, clumsy writing] all the gas Kapital of marks that laboriously strove to tell men that they are but the pawns of economic laws and processes. "Mary spoke to 3 children, ten, nine and seven years of age, and called the modern world back to the great realities. Not the iron-bound law of dialectical materialism, with its spiral of thesis, anthitesis and synthesis, she said in effect, is it is the determinant of history, but the will of man under the will of God. "And history becomes a story of wars, mass suffering and death not primarily because of what they call political and economic factors, but because of sin. Sin is the deep and true evil – the hatred jealousy, pride and lust in the heart of man. "Man will cease to war for the mastery over his fellow man, if he gains the mastery over himself. Thus She is a underlying the need for penance-that exercise and practice by which man repairs the consequences and ravages of sin, and wins true freedom for his well, and rescues it from the shackles of his passion. The other is restatement of the teaching of Christ that she made was a summons to prayer. Pray gives man true vision. By pray he comes to know God; he rises above the level of merely knowing about God. And modern man needs to know God, his beginning and his end, so that he may know himself. The bold and false claim of self-sufficiency, and the pagans humanistic smugness it is in gendered, is a work precisely the liars that's spawned the evil ideas that motivate man today. "May our Lady of Fatima triumph is in this gigantic struggle. Is it visit of this statue has vividly brought to our notice, the plan of campaign is we are to follow. May the Mother of God and of man win for us the grace to persevere in it, and carry it through. "There is no doubt, but that the good people of the earth will triumph if they so act. There is our awful responsibility; there is our roads to victory and glory. 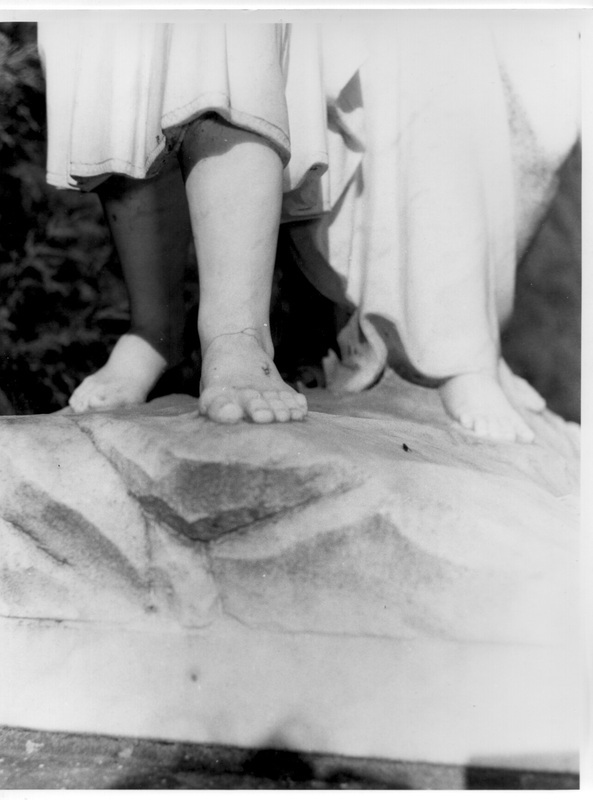 That is the meaning and the message of this small statue journeying through the world on its Pilgrim way." After the benediction, his grace the Archbishop express thanks for the very marvellous occasion is it, and said he humbly thanked our Lady of Fatima. He said the occasion of the visit of the statue have brought great happiness to the many people who have come to see it, and to hundreds of homes. 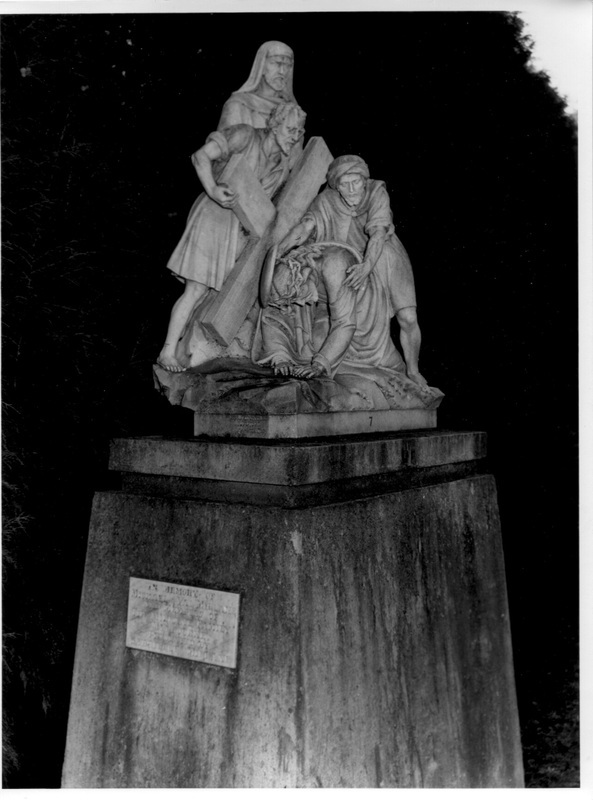 His grace think the members of the Pilgrim party accompanying the statue, and said all would have very happy and holy memories of a day of great joy. Father Demoutiez O.M.I., the Belgian organiser of the pilgrimage, offered his congratulations to all responsible for the beautiful ceremonies in honour of our Lady of Fatima, and said he and his fellow pilgrims would never forget the reception they have got from the people of Goulburn, and all parts of the archdioceses of Canberra-Goulburn." Finally she exhorted all to pray for their souls, pray for their nation, and pray for the world. "Prayer, prayer, prayer and penitence," he emphasised. 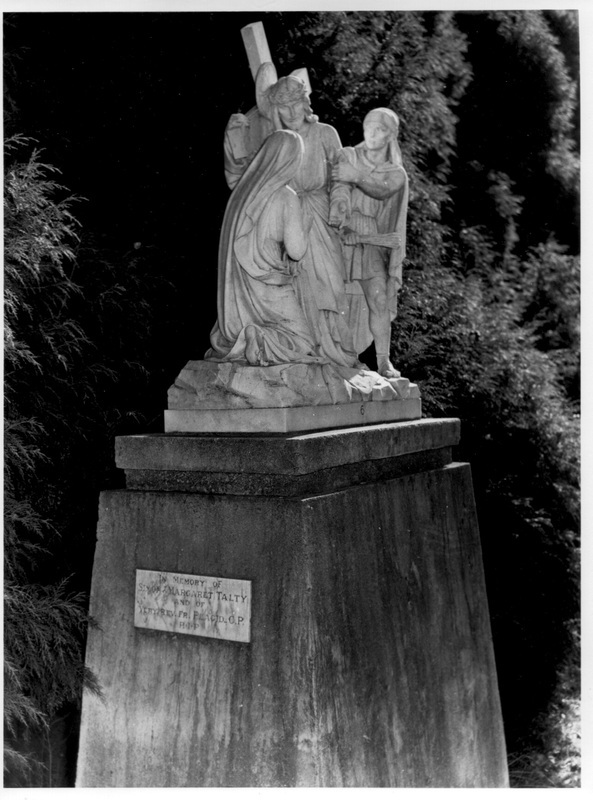 As the statue of the pilgrim virgin was taken to Crookwell on the way to Bathurst, many cars accompanied it on the journey. 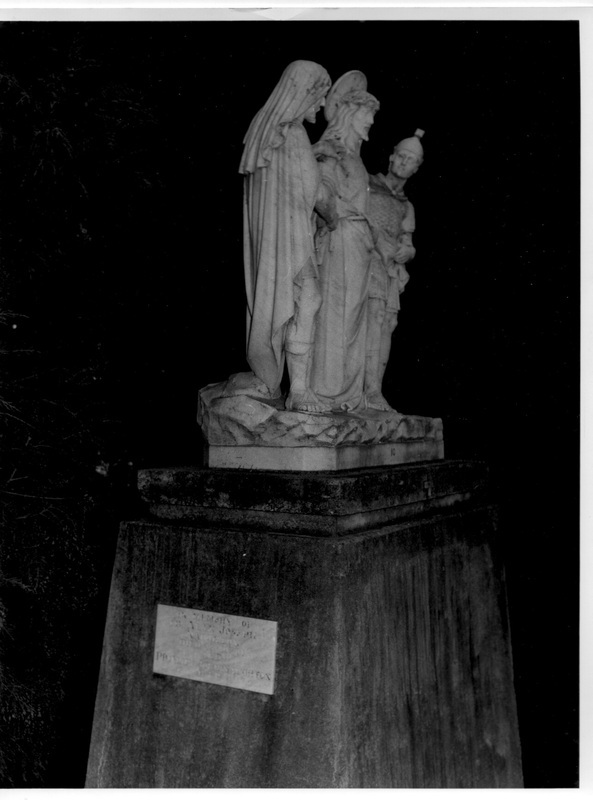 At Crookwell there was a short reception of the statue in the church, after which the pilgrimage went on to Perthville, thence to Bathurst, where an open-air reception took place. The ceremony took place at 3 PM, which is the traditional time for commemorating the death of Christ. Besides residence of Goulburn, many people from surrounding districts and visitors to Goulburn were present. A spirit of deep with reverence was everywhere manifest, and those presents regarded it as an unusually memorable occasion. 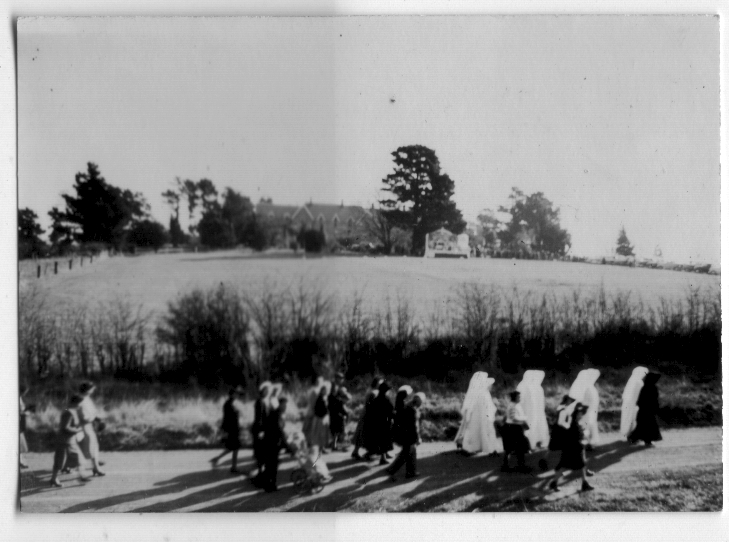 Early in the afternoon a steady stream of people began to pour out along the different roads to Mary's Mount. 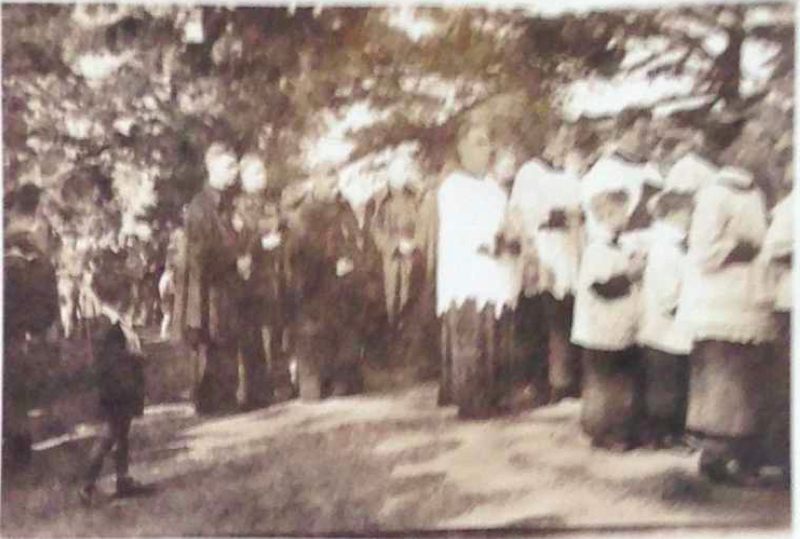 As a special act of sympathy and love for the sufferings of Christ, many chose to make the journey on foot, and groups were led by the clergy from the Catholic Cathedral. The weather, which earlier in the day Hadnot seemed promising, began to improve about midday. Gradually the clouds cleared away and glorious afternoon of warm sunshine followed. Goulburn was looking at its best after the recent rains, and Mary's Mount was a delightful spot with its Greenfields and tall trees and carefully planned walks, terraces and gardens. By 3 o'clock a large crowd had assembled before a specially prepared altar, draped in black. His grace, Archbishop McGuire, was present, and his Lordship Bishop Young, officiated. Fourteen crosses have been set up at different points throughout the grounds to the Monastery, and on each was a picture representing a different Station or scene of the journey of Christ from the judgement Hall of Pilate to Calvary. Led by the local Cathedral clergy, representatives of the Christian Brothers, and members of the Congregation of the Passion, the huge crowd passed from Station to Station, meditating briefly on each scene. The meditations were read by the Rector of the Passionists Monastery, Father John C. P., and were carried by amplifiers to all parts of the grounds. After each meditation a portion of the him "Stabat Mater" is was sung, led by the sweet voices of the choir of girls from St. Joseph's Convent, North Goulburn. Children were present in uniform from the different catholic schools and colleges of Goulburn. A notable spirit of devotion possess the great crowd which moves slowly from seen to seen in perfect silence, except for the recitation of prayers and the singing of hymns. 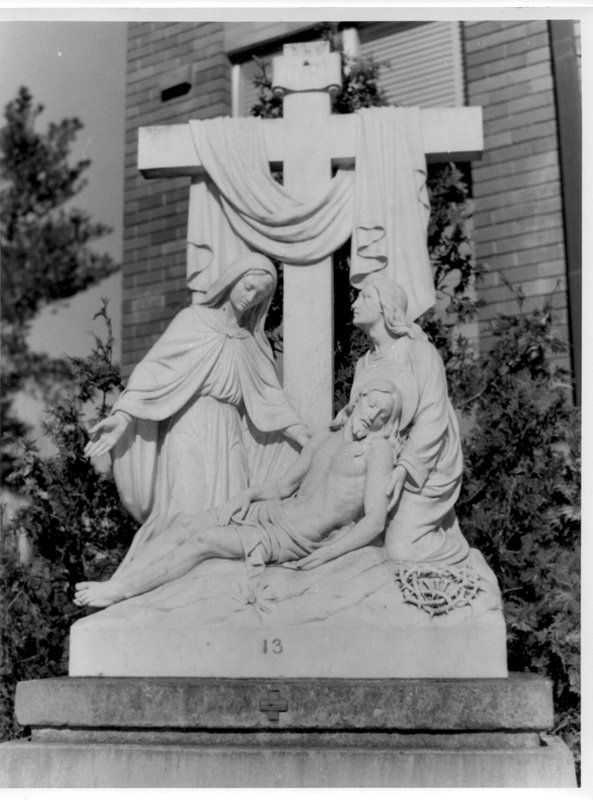 At the 12th station, which represents the death of Christ on Calvery, a sermon was delivered by Fr. Augustine, and a member of the Passionists Order. In his sermon Fr. Augustina said: "Love is the explanation of Calvary. Love caused it, Love suffered it and only Love can understand it. 'He loved me and delivered Himself for me." "As Jesus home in agony on the cross the Jews blasphemed Him. 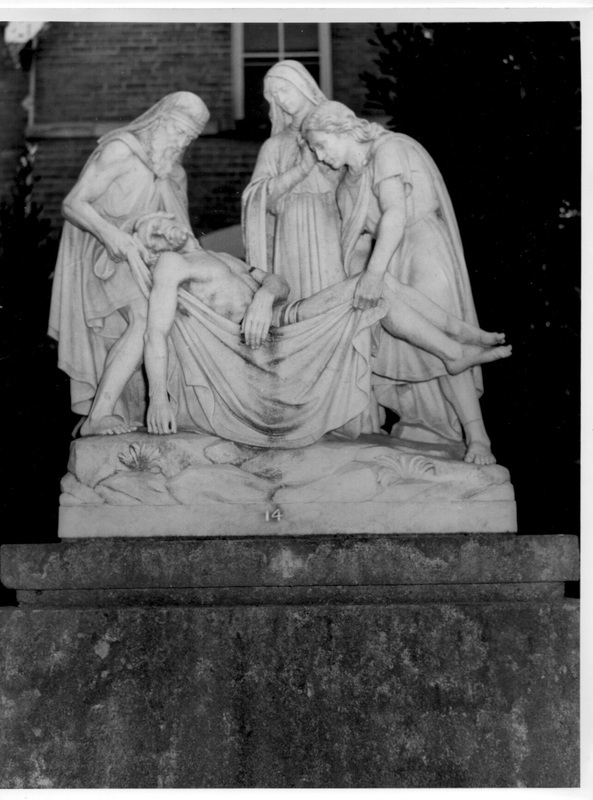 But when that sacred head had sunk upon the chest of the Divine Victim the scene changed. They shrank in terror, the earth quaked, the rocks were rent, the people clasping their hands ran madly down that hill of Calgary, only to find there before then, walking in the streets, the white sheeted ghost of men and women long dead. The Jews cried out in terror, they looked upon seeing who they had pierced and their hearts were struck with fear. "And now to-day, you look upon Him Whom you have pierced. Can you fathomed the idea that Calvary was not complete on the first Good Friday? Can you understand that even now men and women are nailing to the Cross the Son of God? 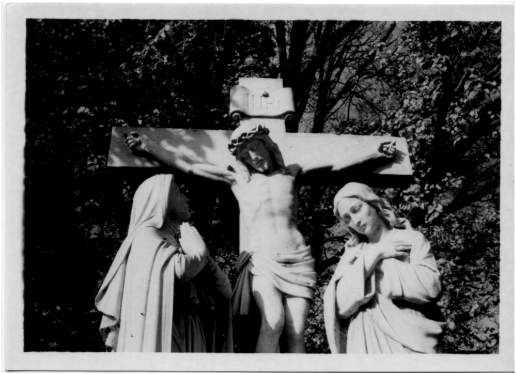 A Cross nought of wood, a Cross not of stone, a Cross not made of the fleshy tablets of the heart. For as often as we commit mortal sin, we crucify again the Son of God and make of him a mockery. Like the Jews of old, like the Romans, you look upon him who you have pierced. "The Jews fled in terror, the Romans were converted, what of us?" Then he exhorted those present to raise their arms in the form of a cross and in silence to consider their own part in the tragedy of the Crucifixion of the Son of God. Finally all recited together an act of sorrow. After the sermon two more scenes were meditated upon, which represented Christ being taken down from the Cross, and finally his burial. When the final prayers had been said Bishop Young delivered a short address. Referring briefly to the presence of the Archbishop, he said: "His grace wants me to think the Passionist fathers for the preparation of the Stations of the Cross and for conducting the ceremony. 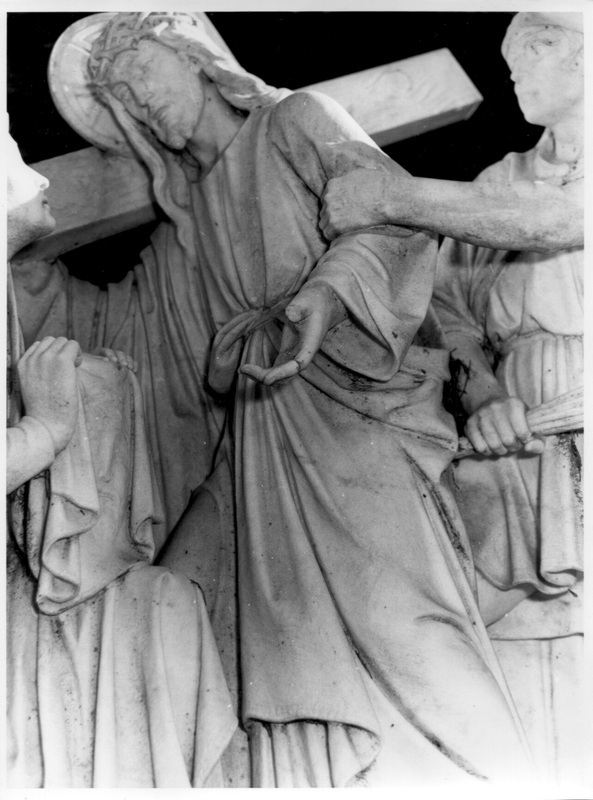 I myself have attended many stations of the cross in different parts of the world, but I do not think that I have experienced anything more moving, or anything that brought more clearly to my mind the sufferings and death of my Saviour. I am sure that each and everyone of you could say exactly the same thing. We thank the Passionist Fathers, we thank the children for having prepared to hymn, and also His Grace wants to say how pleased he is and how delighted to see you, his people, gathered here for the first time. Please God, as the years roll by, the crowd will become bigger and bigger. "This afternoon you have gained and indulgence. In other words some of that satisfaction that our Divine Saviour, the Son of God, made for the sins of mankind has been shared out to you by the Church as you went around this Way of the Cross. "And you have seen as you went round from Station to Station what your sins have cost. They have cost the suffering and death of a God made Man. Therefore you have become more conscious of how terrible sin is, and that is a most important thing in this world to-day. "Thus you go home from Mary's Mount sanctified and please God strengthened, and please God determines to try and avoid send in the future and to try and grow in virtue. "May God bless the Passionist Fathers and may God bless this new undertaking in the Archdiocese of Canberra and Goulburn." After the ceremony, the Rector of the Monastery, Fr. John C.P., expressed his joy and gratitude at the enthusiastic response of the catholic people of the Archdiocese. He said that the stations would be repeated each year on Good Friday. 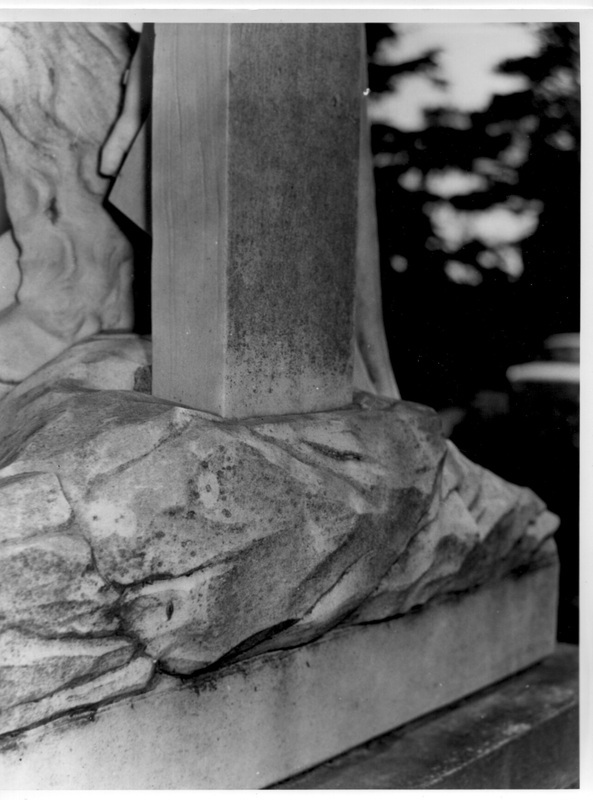 It was hope that eventually statues would be erected representing the different scenes. Some generous benefactions had already been received and for this he was deeply grateful.